cruise ship terminal – Cool San Diego Sights! 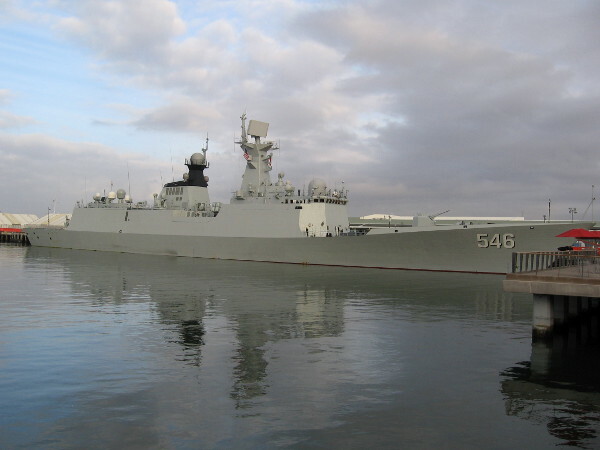 Posted on December 6, 2016 December 6, 2016 Tags china, cruise ship terminal, culture, embarcadero, military, navy, peace, sailors, san diego, san diego bay, ships, united states5 Comments on Photos of Chinese warship visiting San Diego. 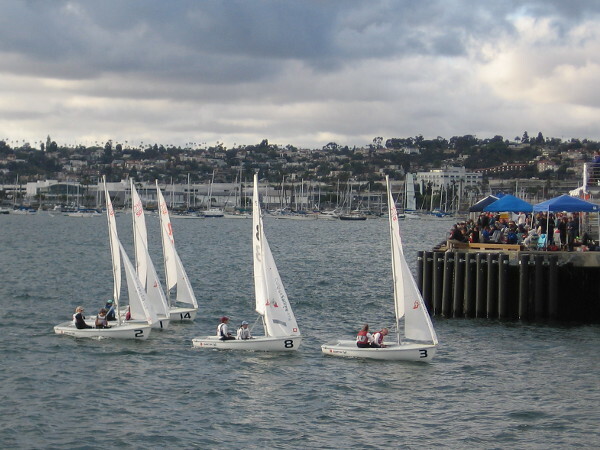 College sailing: Women’s National race on San Diego Bay! 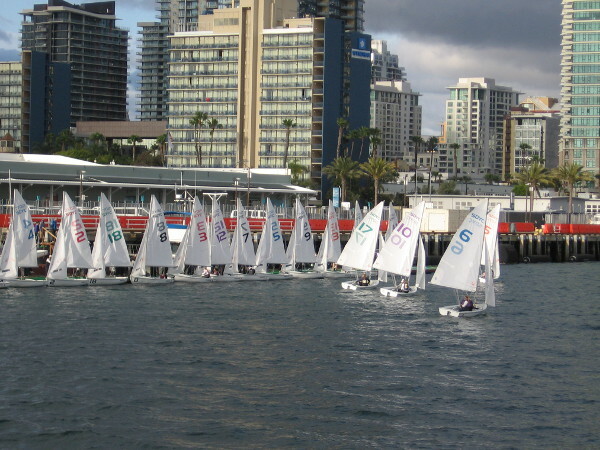 ICSA Women’s Semifinals on San Diego Bay. 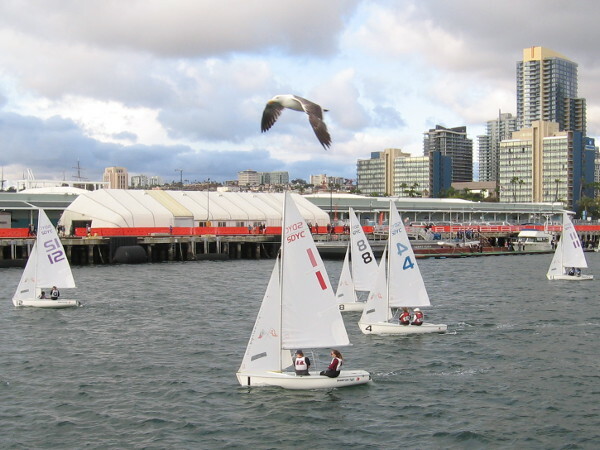 Competing sailboats approach downtown’s Cruise Ship Terminal. Check out these cool photos! I was walking along the Embarcadero early this evening when I saw dozens of tiny sailboats out racing on silvery San Diego Bay. 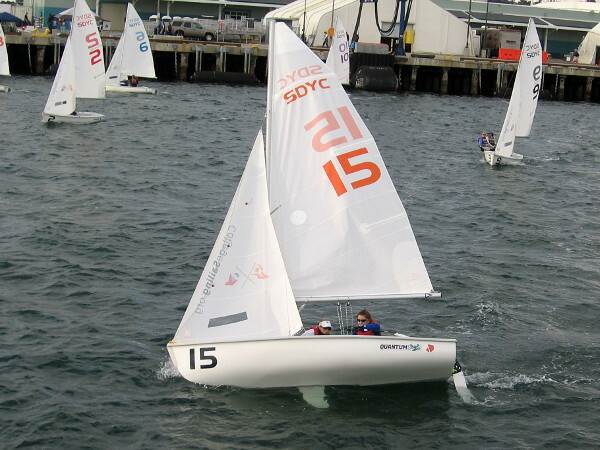 I noticed the sails featured the letters SDYC, which stands for San Diego Yacht Club. When I got home, an internet search revealed that I had been observing the first day of ICSA Women’s Semifinals action. 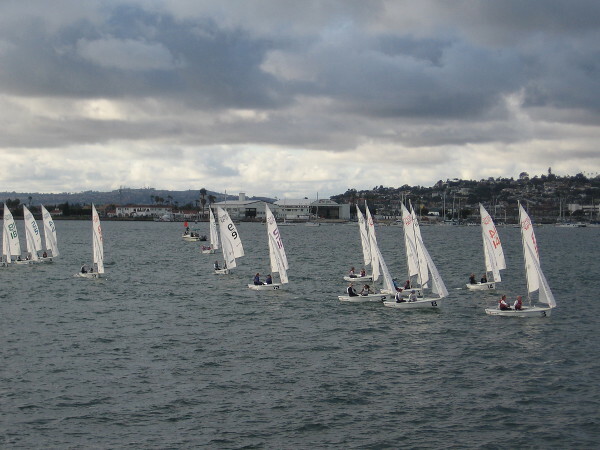 San Diego is the location of the 2016 College Sailing / Sperry Women’s Nationals. The 36 sailboats that I watched represent top universities from all around the United States, which are competing through Friday right here on our beautiful bay! Winner takes home the coveted Inter-Collegiate Sailing Association’s Gerald C. Miller Trophy! 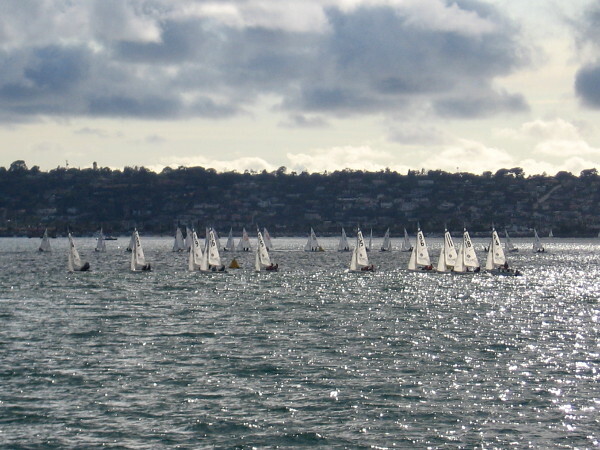 Small sailboats float on rippled silver, beneath dramatic clouds. Shining sails dance in the wind, as paired sailors from 36 colleges around the country compete in the Women’s Nationals. 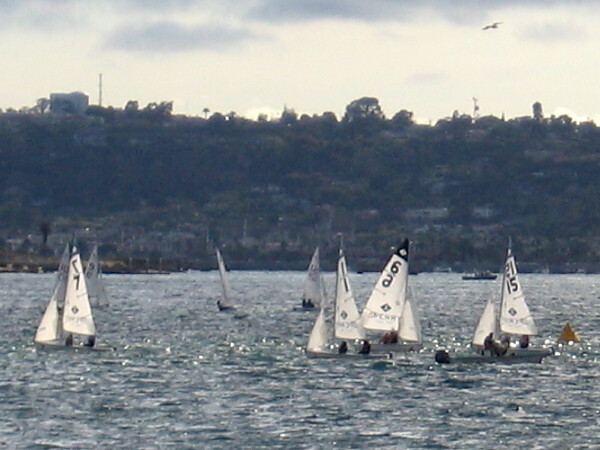 A zoomed photo of the sailboats dancing across San Diego Bay. 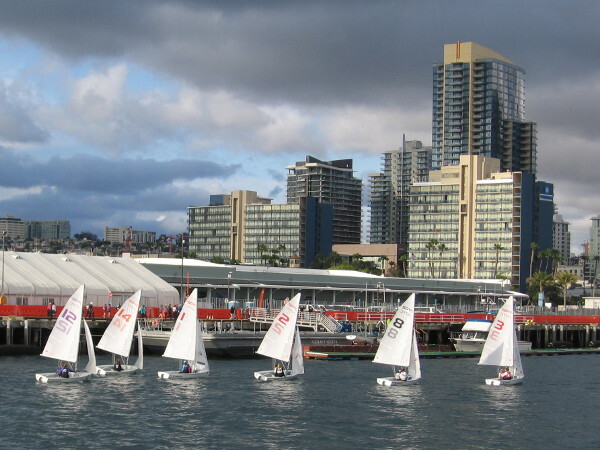 The San Diego Yacht Club sailboats approach the Embarcadero, having just passed the finish line. These sailors were among the leaders. The top 18 semifinalist teams will move on to the finals. A very cool sight during a random walk along the water before sunset! 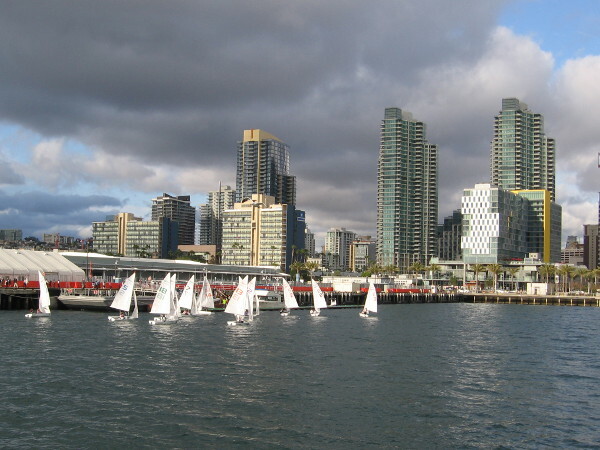 The leading sailboats approach San Diego’s Cruise Ship Terminal. Gleaming skyscrapers rise in the background. The leaders from this race appeared to line up in finishing order. Fascinated, I watched from the Broadway Pier. And then a few minutes later they were off again! A gull watches sails dip and tack in the sea breeze, like fluttering white wings. 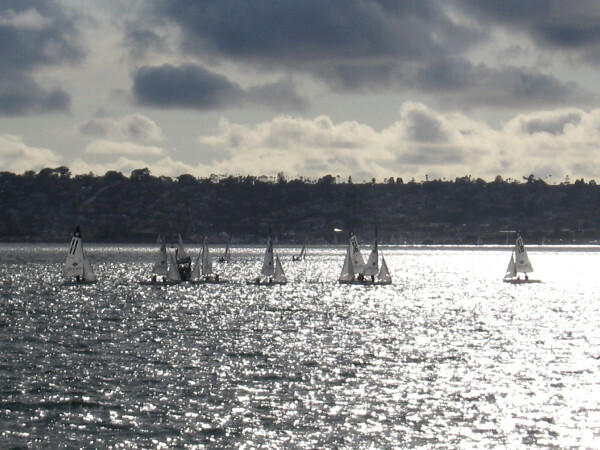 A team that competed in College Sailing’s ICSA Women’s Semifinals starts back across San Diego Bay before night falls. 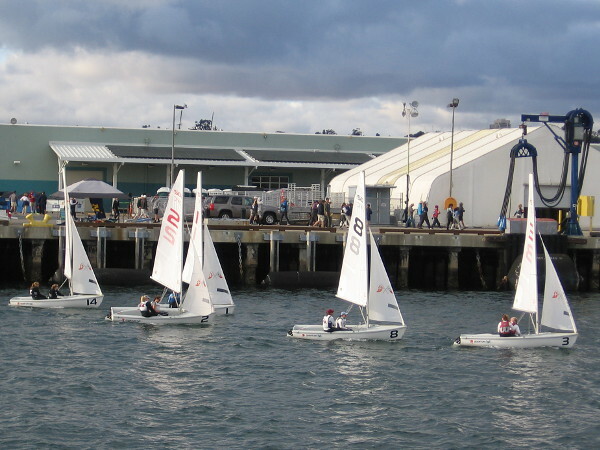 Posted on May 24, 2016 May 24, 2016 Tags cruise ship terminal, downtown, education, embarcadero, events, photography, racing, sailboats, sailing, sailors, san diego, san diego bay, schools, water4 Comments on College sailing: Women’s National race on San Diego Bay! 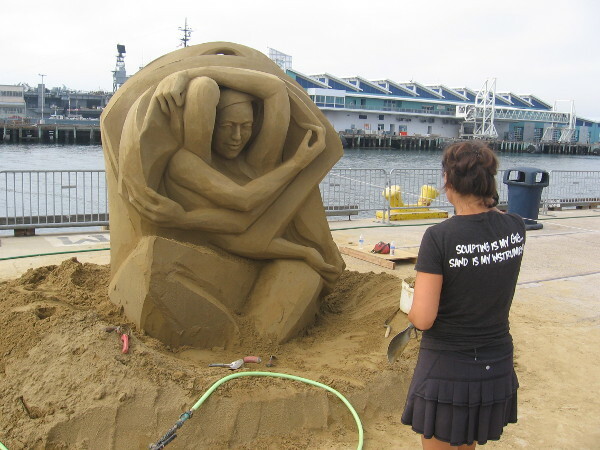 Photos of amazing, incredible sand sculptures! 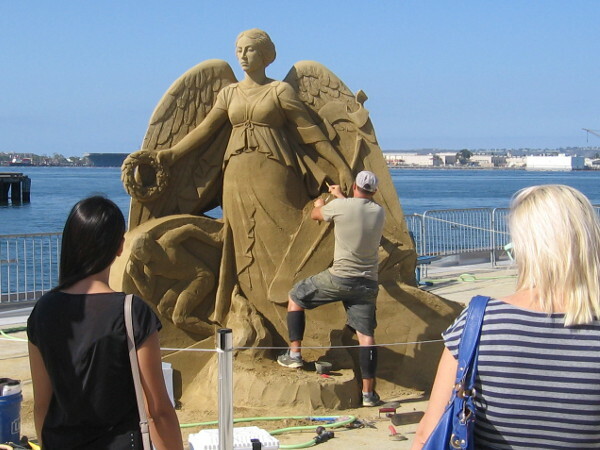 Many of the world’s best sand artists are in San Diego for the 2015 U.S. 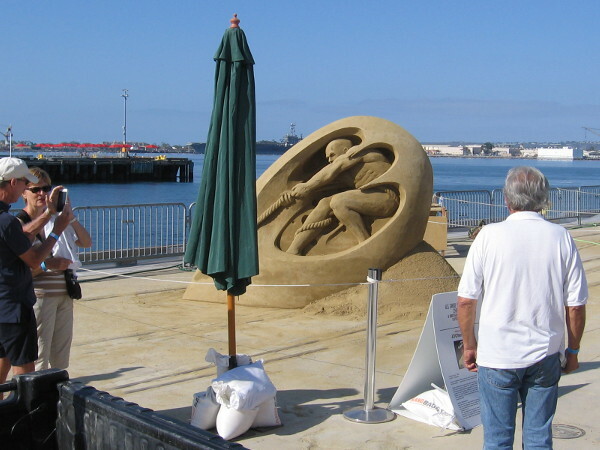 Sand Sculpting Challenge. 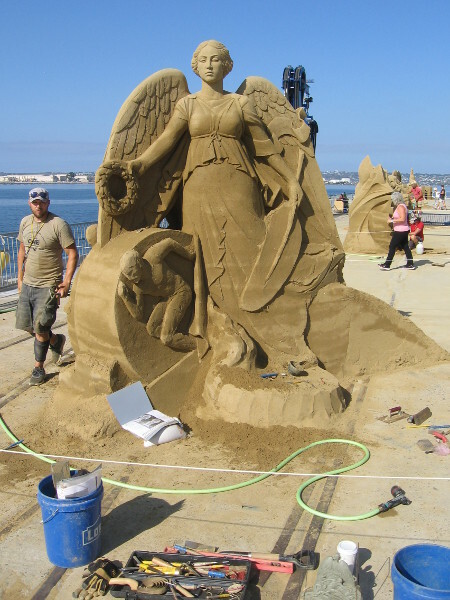 Right now, the world’s most amazing sand sculptures are standing on the B Street Pier on San Diego’s Embarcadero. 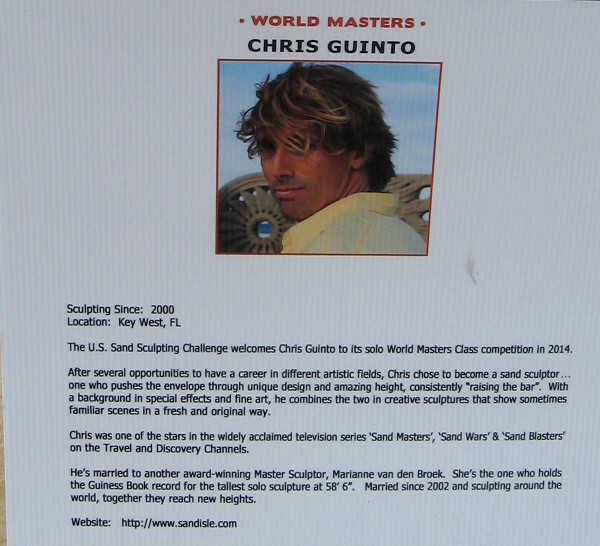 They were created by a select group of international sand masters for the 2015 U.S. 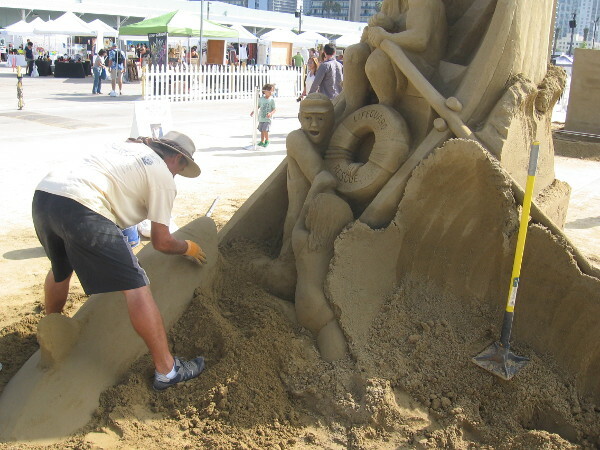 Sand Sculpting Challenge. 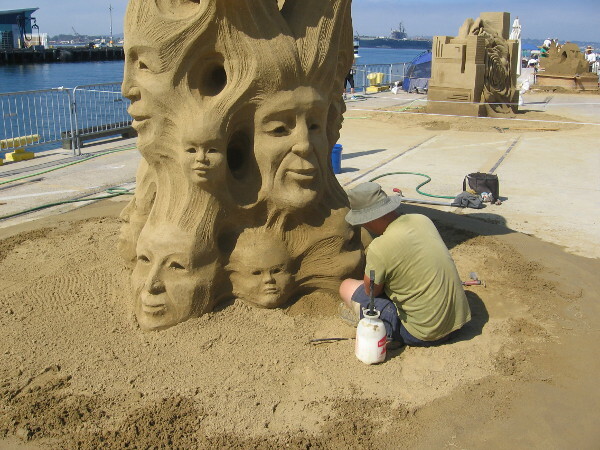 These talented sculptors are world-class artists, as you can see from the following images. My photos were taken on Saturday morning shortly after the gate opened. 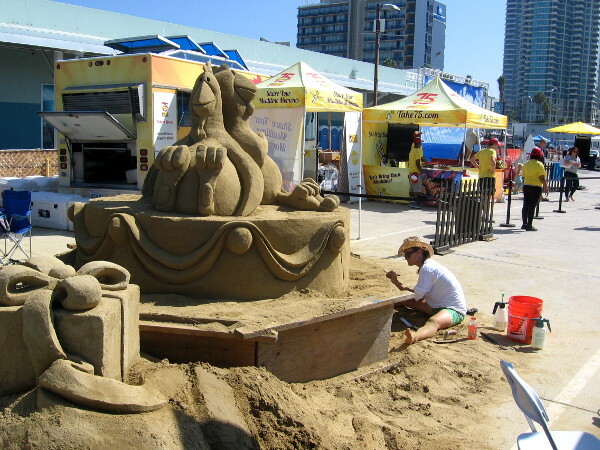 All of the competing artists were on the pier adding the final touches to their incredible artwork. 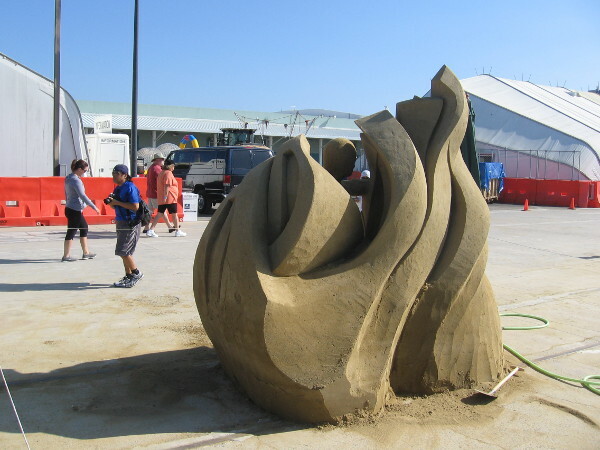 The sculptures will be officially judged this afternoon. The theme of the U.S. 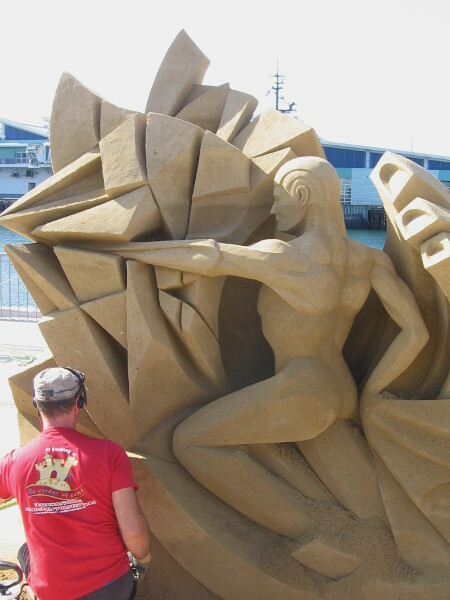 Sand Sculpting Challenge this year is the Olympic Games. 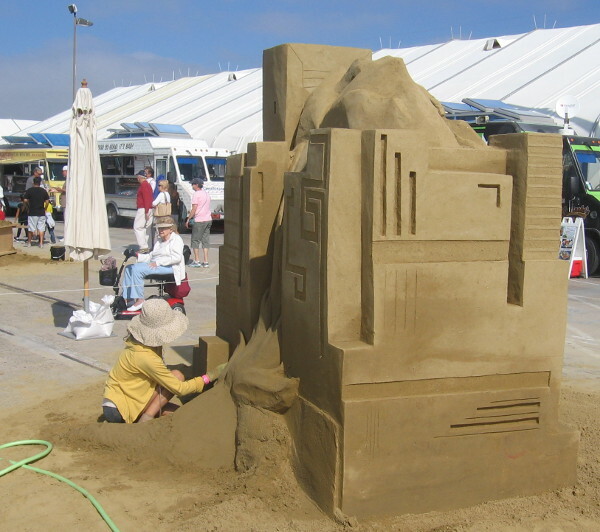 Many of the sand masterpieces had a classic, sculptural relief appearance. Every one was sensational. 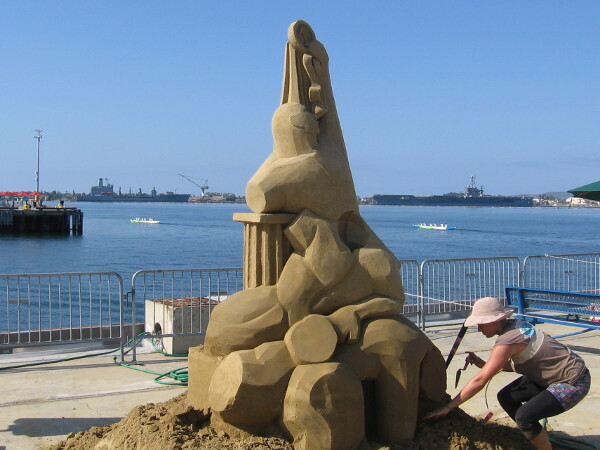 The competitive event, which takes place downtown at the edge of our beautiful bay next to the Cruise Ship Terminal, continues through Labor Day weekend. If you can’t make it, enjoy these photos! 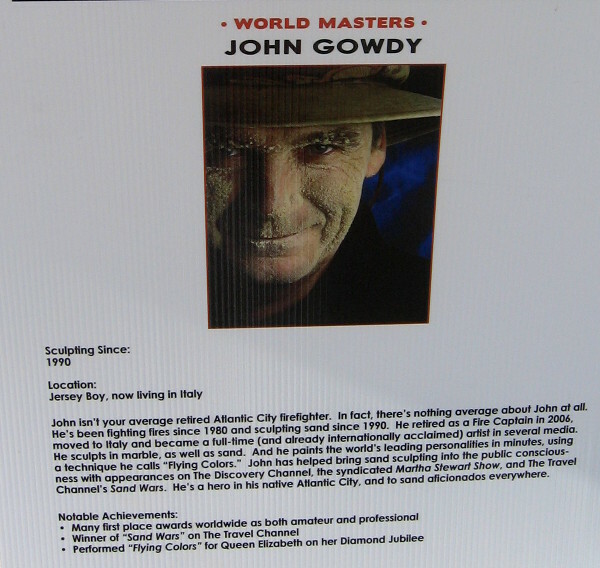 John Gowdy, Jersey Boy, now living in Italy, has been sand sculpting since 1990. 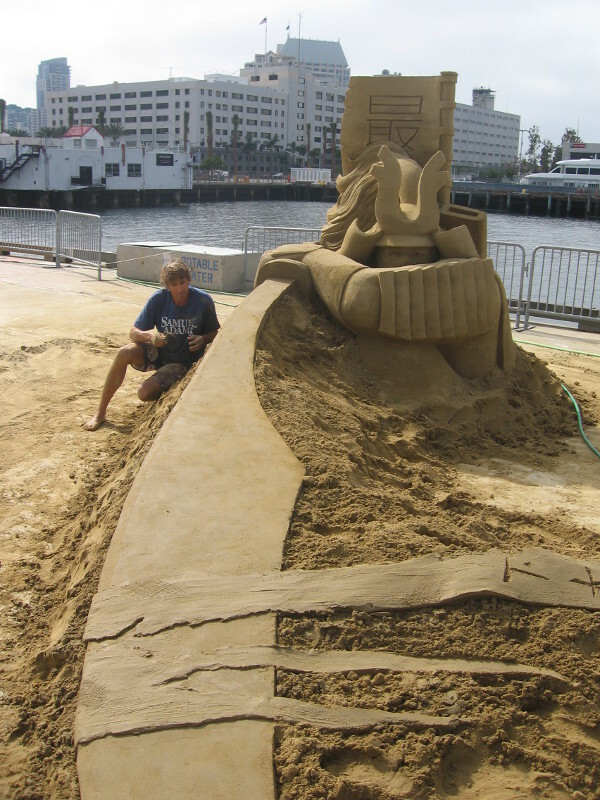 He was winner of Sand Wars on the Travel Channel. 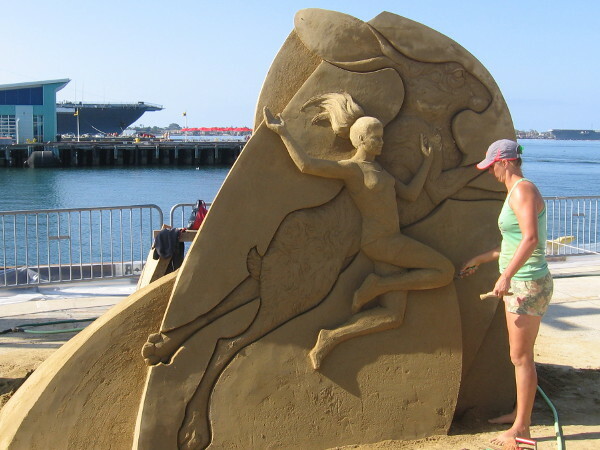 John Gowdy’s Olympics-themed sculpture features Bruce Jenner, men’s decathlon winner in 1976, and his transformation to female Caitlyn. 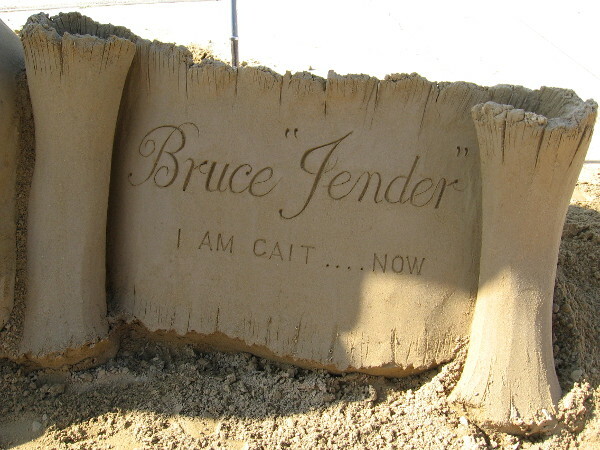 Bruce Jender. I am Cait…now. Unzipping a past gold-winning athlete. A new person emerges. 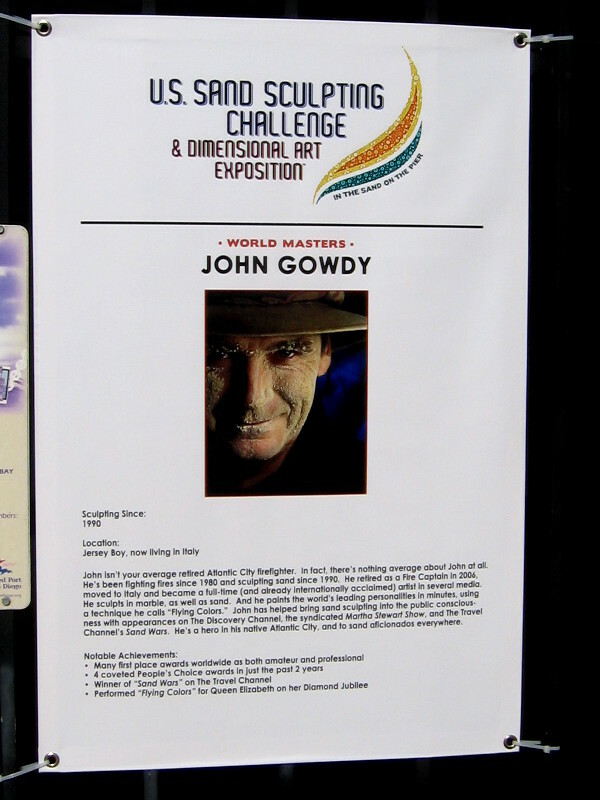 John Gowdy is interviewed by a video production crew at the 2015 U.S. 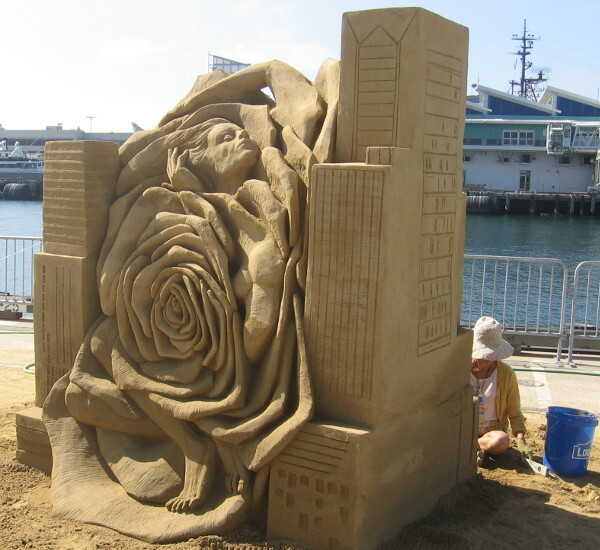 Sand Sculpting Challenge. 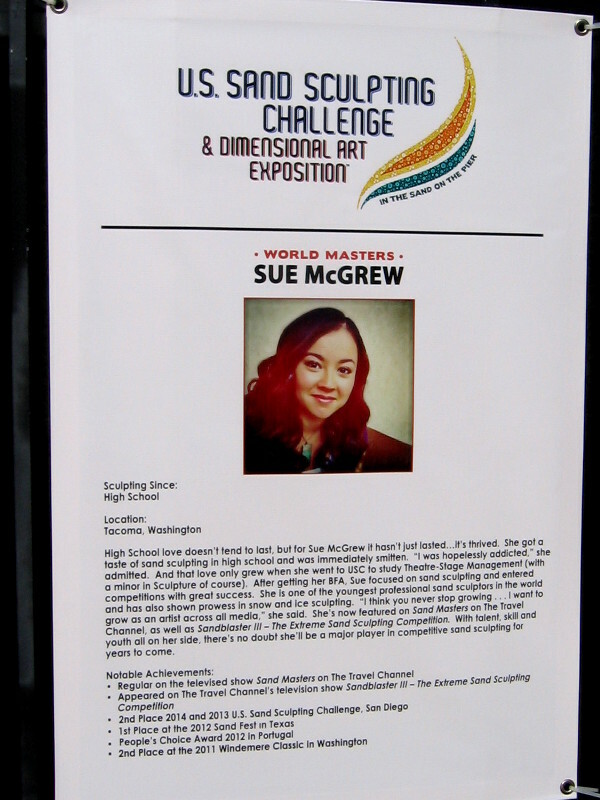 Sue McGrew, from Tacoma, Washington, is also accomplished in snow and ice sculpting. 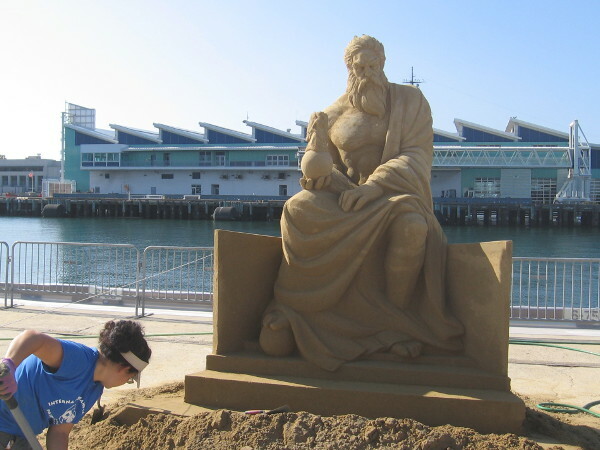 Sue McGrew’s sand sculpture titled Father of the Game, a statue-like image of Zeus, king of the Greek gods on Mount Olympus. 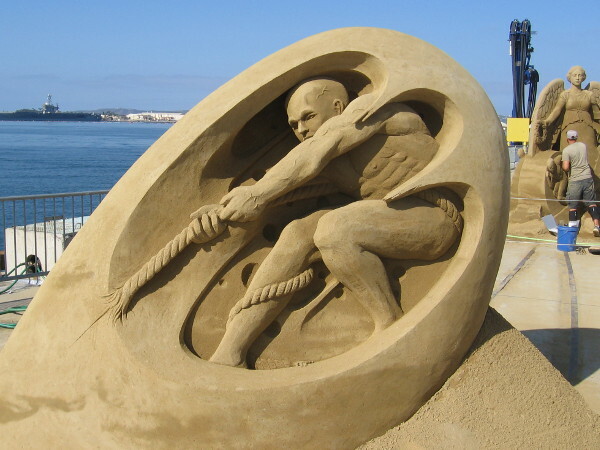 Amazing artistic skill is required to sculpt sand so perfectly. 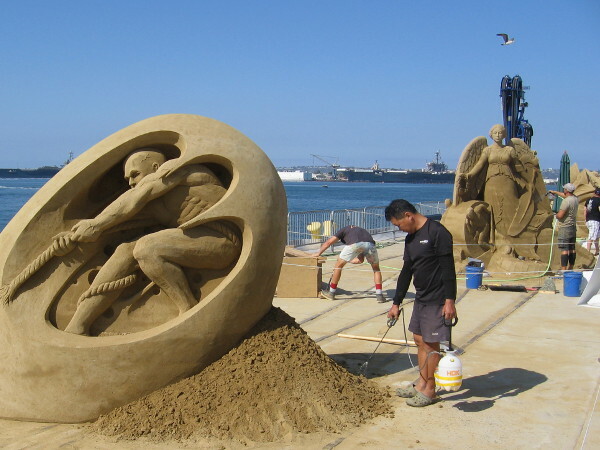 These sand masters, like Olympic athletes, are the best in the world! 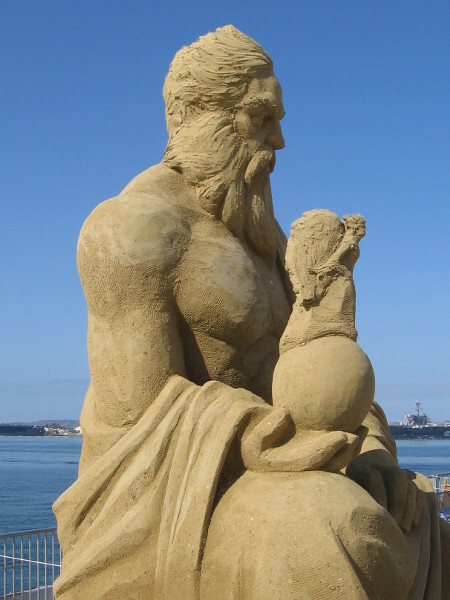 Zeus seems to be sitting at the edge of the B Street Pier in downtown San Diego! The Port Pavilion and the Broadway Pier are in the background. JOOheng Tan, of Singapore, won last year’s competition! He has been called Vincent Sand Gogh! JOOheng Tan’s sculpture, Game Over, is a striking work of art that immediately caught and held my eye. Just an amazing, incredible work of art. You don’t see something like this everyday! In a few days it will be swept away. The artists are still at work, getting their pieces ready to be judged this afternoon. 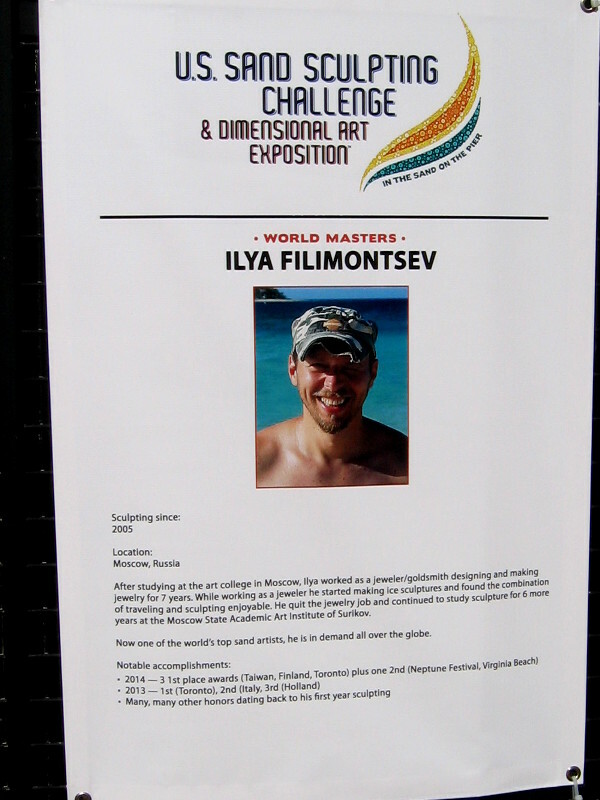 Ilya Filimontsev, from Moscow, Russia, is competing here for the first time, and I predict he will win an award! I voted for him and saw others doing the same. Ilya Filimontsev’s sculpture is titled Never Give Up!!! Wow! 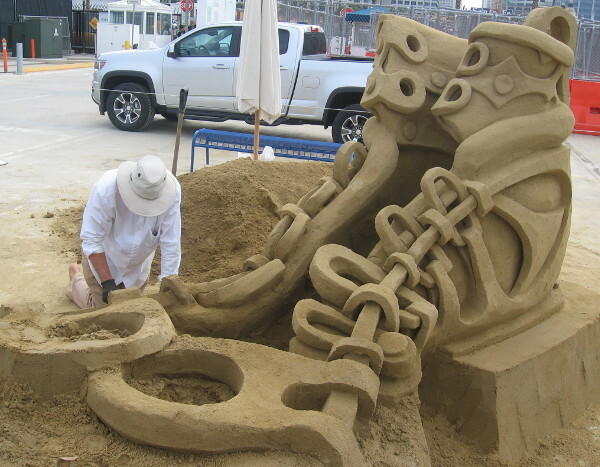 Now that’s an impressive sand sculpture. And he wasn’t finished! Carefully working beneath a wing and Olympic olive wreath on a sunny San Diego Labor Day weekend. 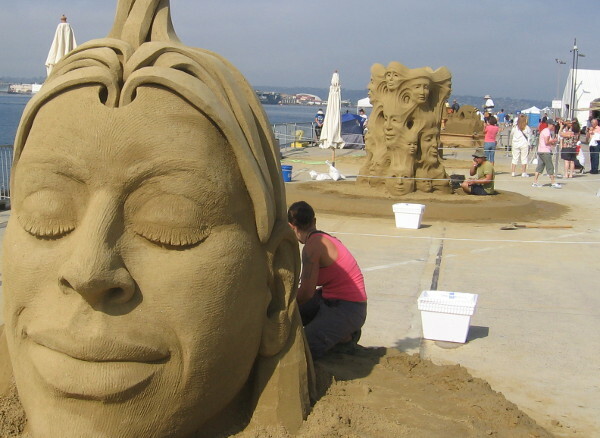 A masterpiece of sand is being created as the public watches and takes photographs. 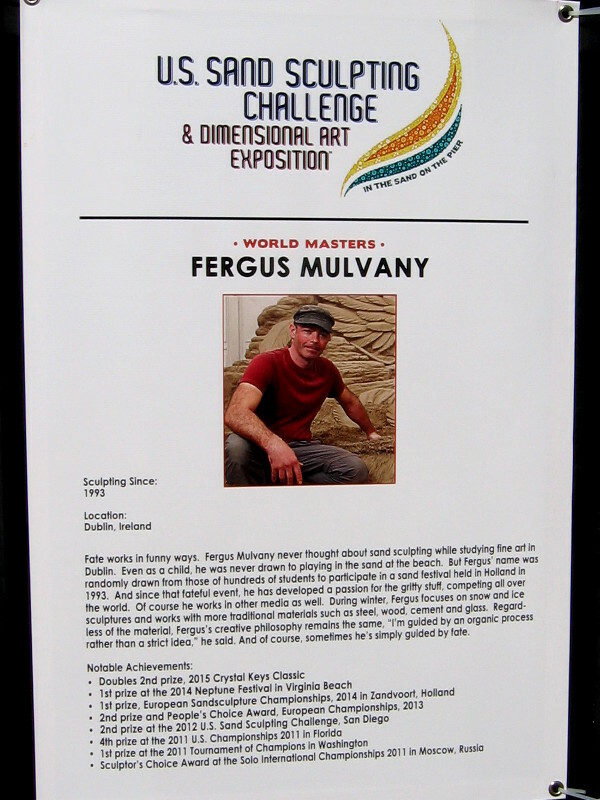 Fergus Mulvany is from Dublin, Ireland. 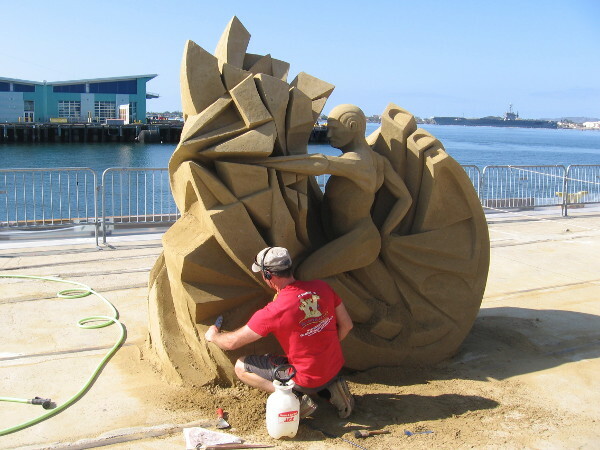 He studied fine art and became a sand artist as a student by chance! Fergus Mulvany is working on his creation called The Threshold of Momentum. It’s a fantastic piece, one of my favorites. 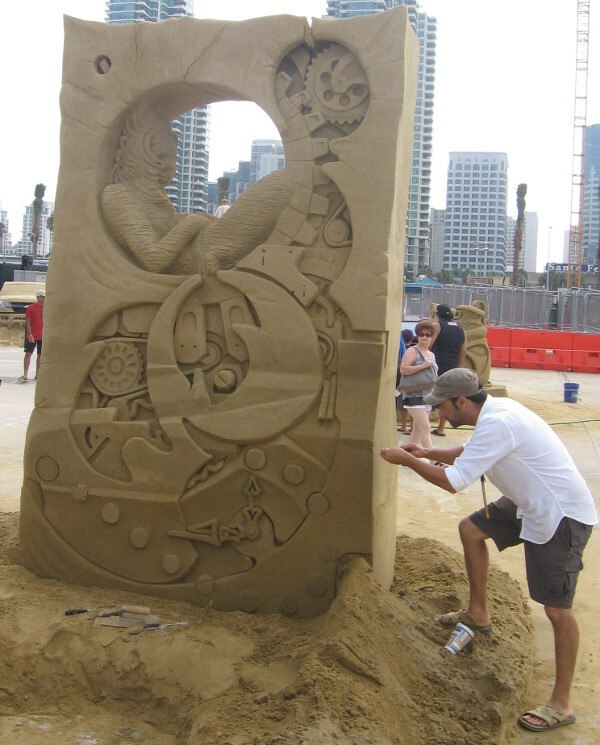 Closer photo shows superb detail work of the kinetic sand sculpture. Back side of The Threshold of Momentum is simple and stylish. 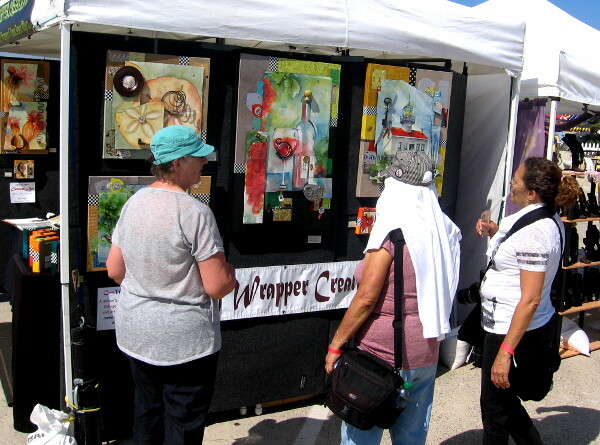 The artists were all friendly and didn’t seem to mind chatting with folks who were admiring their works in progress. 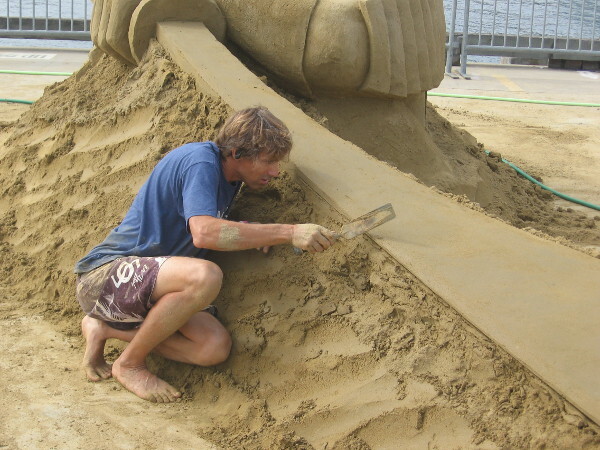 Dan Belcher, of St. Louis, Missouri, is 14 time world champion sand sculptor! 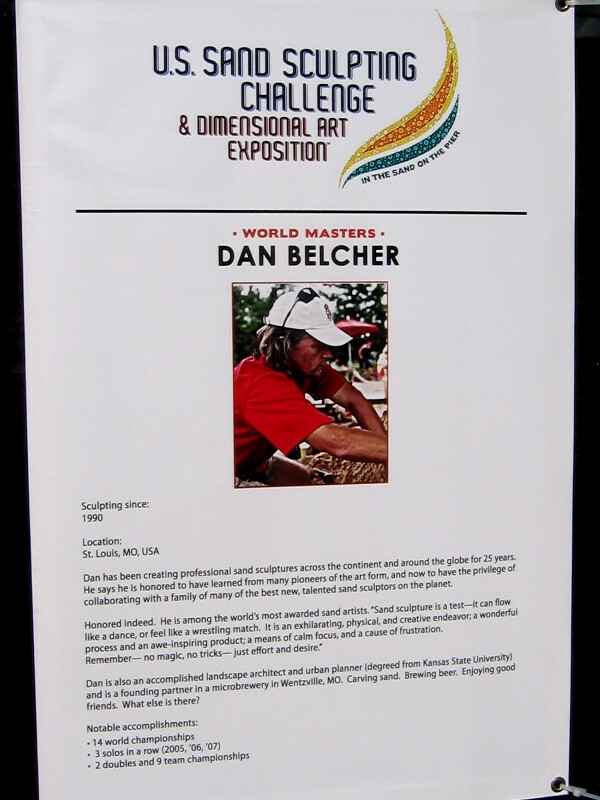 I can see why Dan Belcher has won so many world championships. The artistry of his piece, Citius, Altius, Fortius, is exceptional. Citius, Altius, Fortius is Latin for Faster, Higher, Stronger. It’s the Olympic Motto. 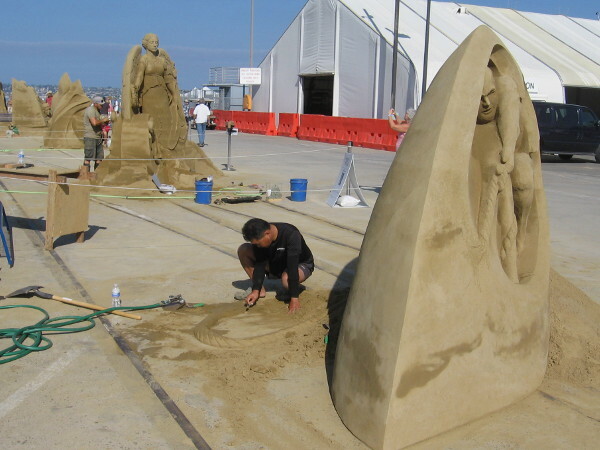 Human figures shaped from sand have bold form and physical presence. 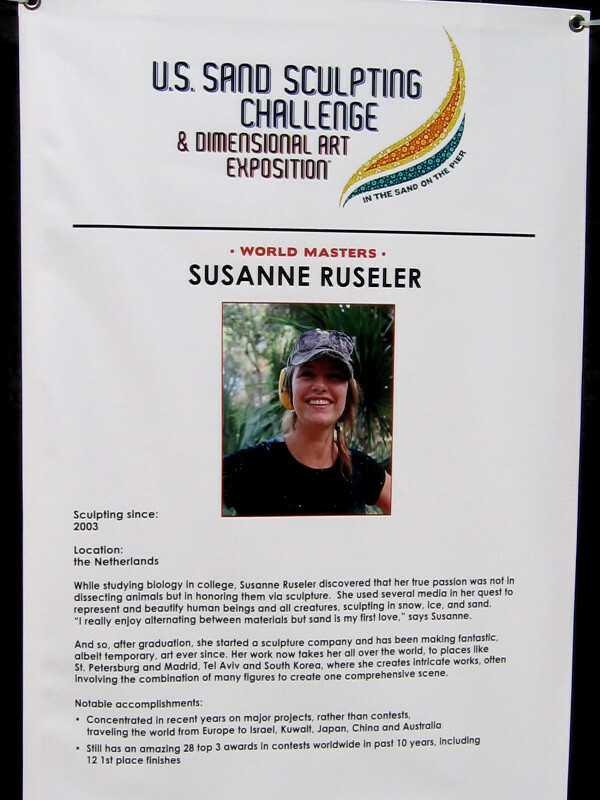 Susanne Ruseler, from the Netherlands, studied biology and thereby learned to represent and beautify human beings and all creatures. She has won many contests. 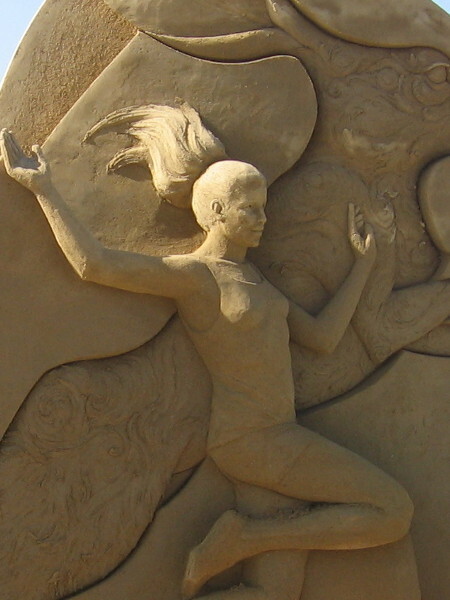 Susanne Ruseler’s sculpture is called Long Jump. An Olympic athlete leaps like a rabbit! 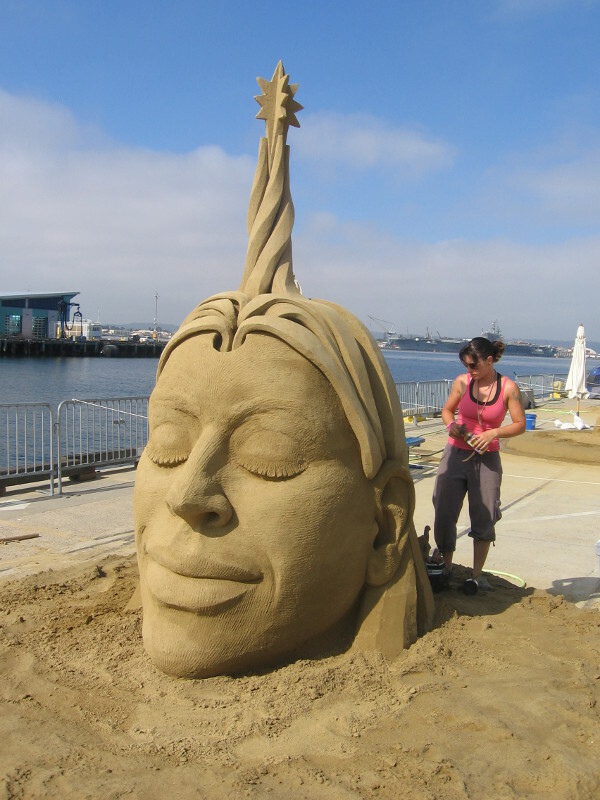 Flowing hair made of sand. Incredible. 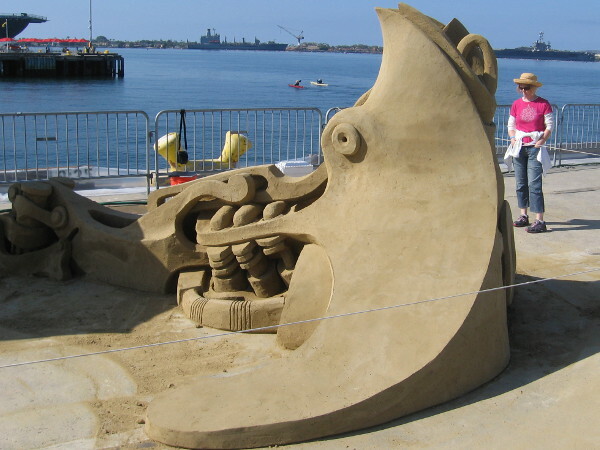 I saw lots of water hoses, buckets, shovels and carving tools being used on the large sand creations. 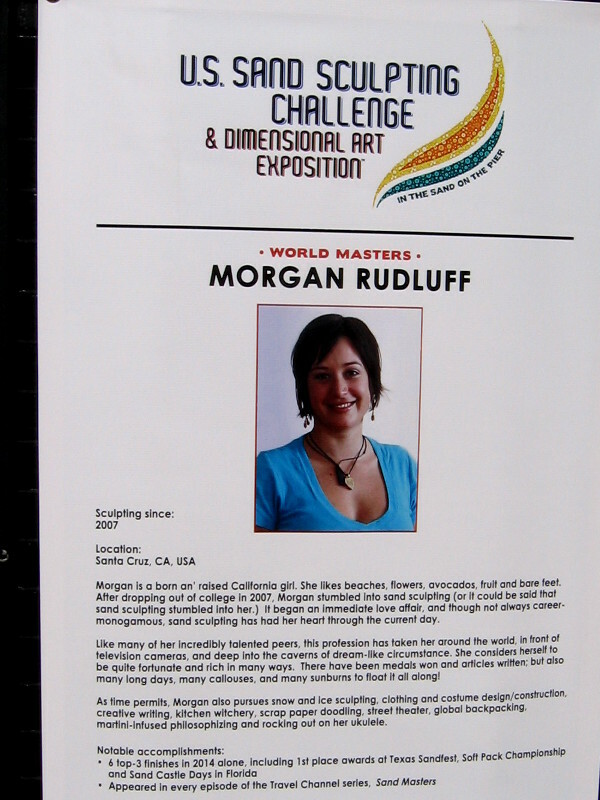 Morgan Rudluff is from Santa Cruz, California. She considers herself to be quite fortunate and rich in many ways. 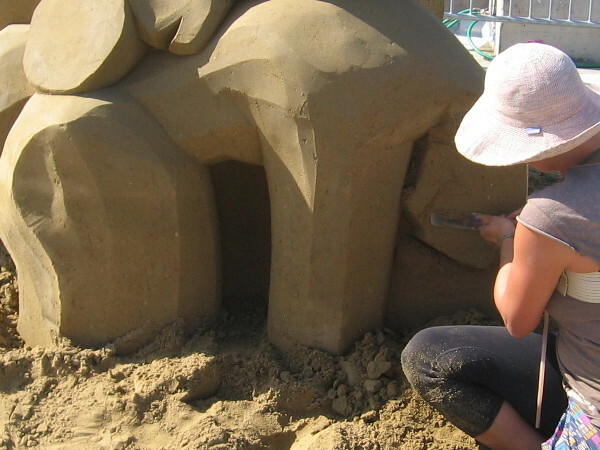 Sand sculpting has her heart. 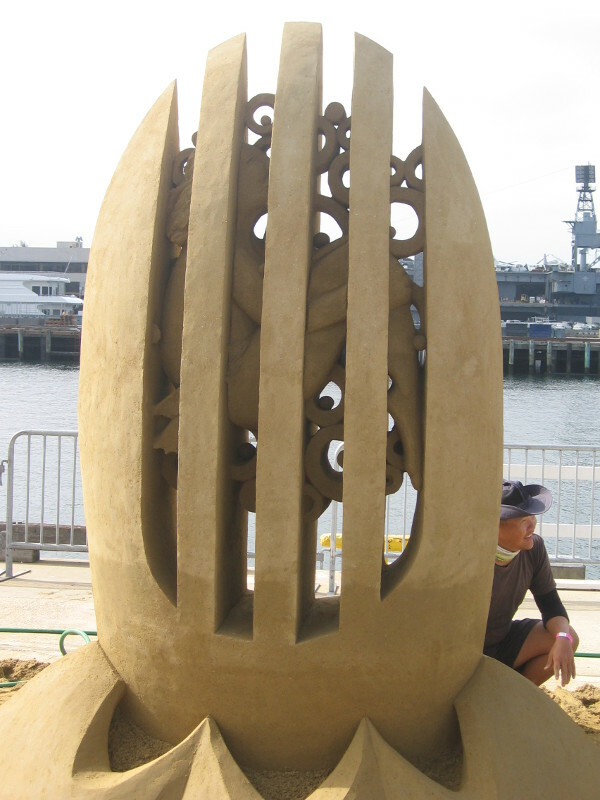 Morgan Rudluff’s sand sculpture is Perseverance. It appears to be a tower made of a Greek column and abstract human forms. We’re nearing the end of the B Street Pier, gazing out at blue San Diego Bay. 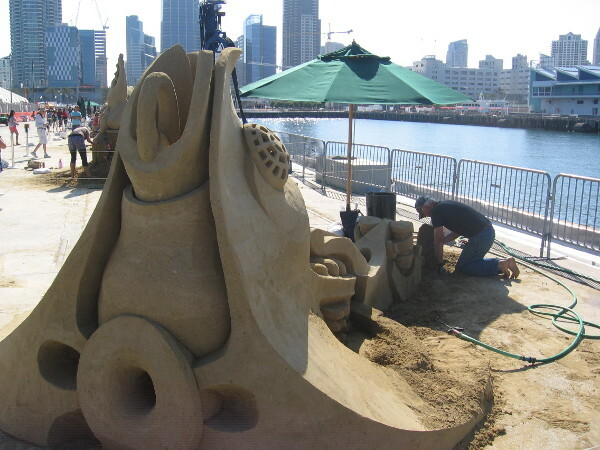 Many hours of hard work and perseverance combined with imagination and skill produces a fine result. 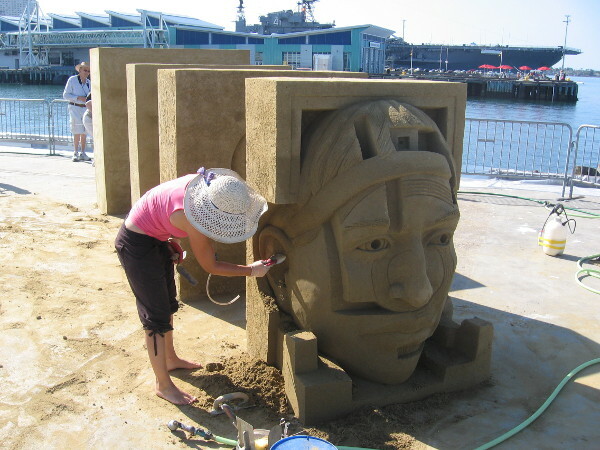 The steady hand of a world-class sand artist. 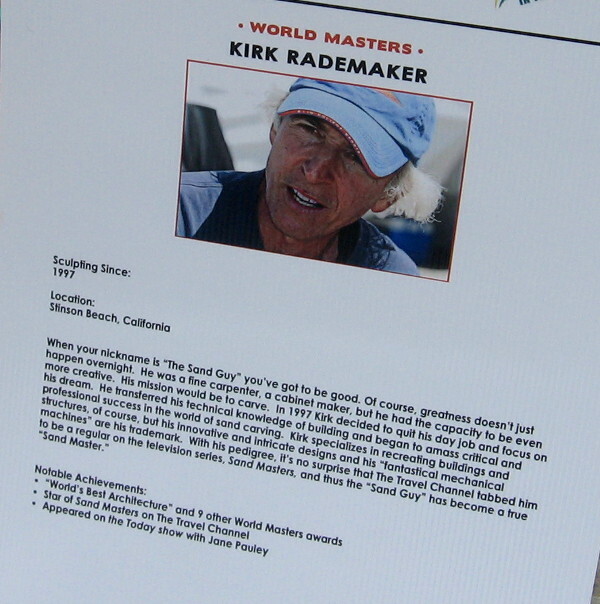 Kirk Rademaker comes from Stinson Beach, California. His nickname is The Sand Guy. Fantastical mechanical machines are his trademark. 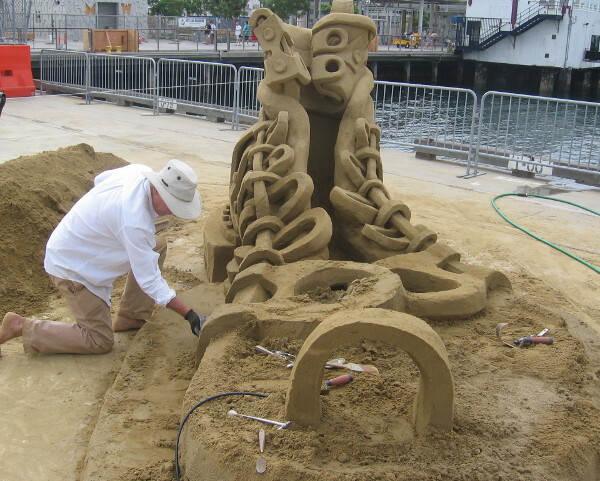 Kirk Rademaker is creating a piece called Anchor Leg, which indeed resembles an anchor. How appropriate, because it’s by the water! The skyline of downtown San Diego can be seen to the east. It’s a warm day and promises big crowds. 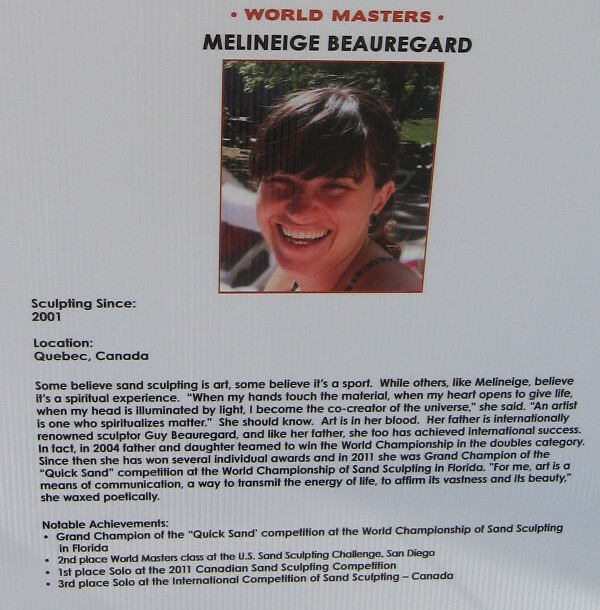 Melineige Beauregard is from Quebec, Canada. 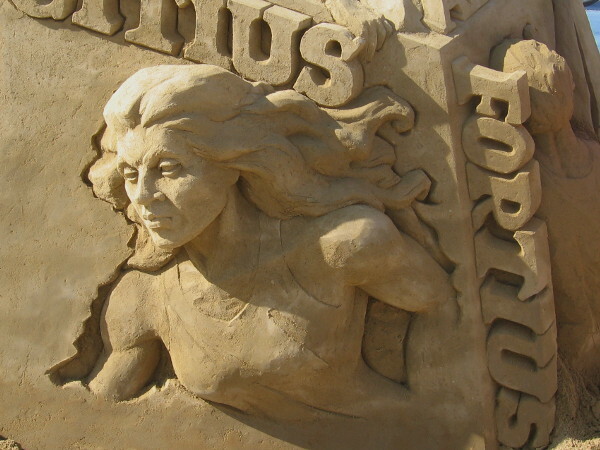 Some believe sand sculpting is art, some believe it’s a sport. She believes it’s a spiritual experience. Melineige Beauregard’s artwork is called In The Zone. I believe it was the most original creation of all the entries. You’ll see why. 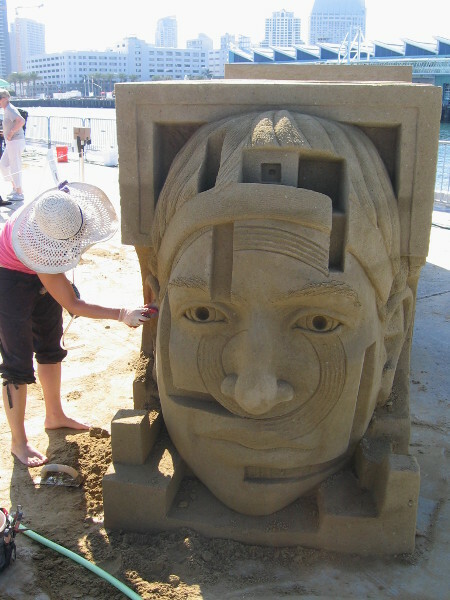 An interesting face decorates one end of the complicated multi-part sand sculpture. The opposite end features a circle, like an eyepiece, through which visitors are meant to look. And this is what we see! An Olympic runner ready to race at the starting blocks! 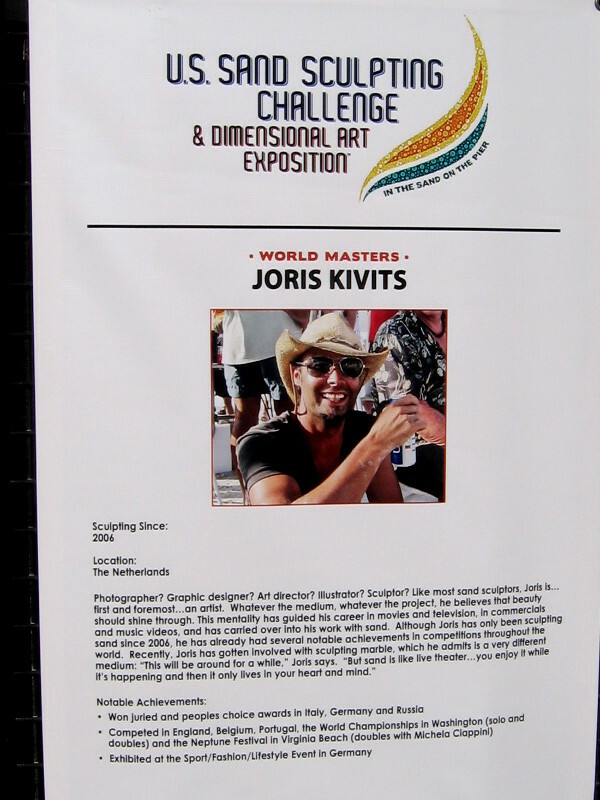 Jorvis Kivits, of the Netherlands, believes that in art, beauty should shine through. He has recently begun sculpting marble. Photo Finish is the name of Jorvis Kivits’ curvy piece. It’s an unusual, wonderful thing to behold! 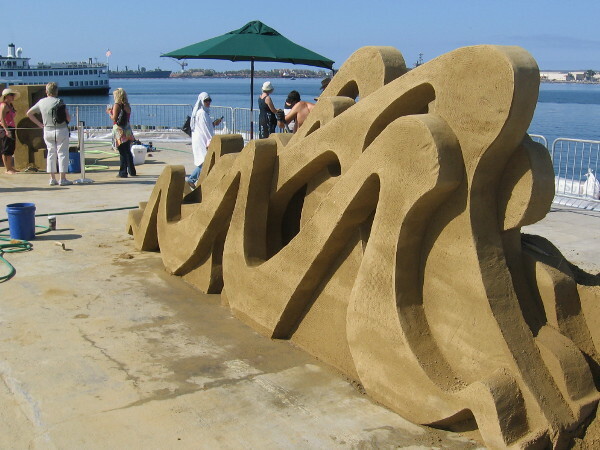 Gazing through some world-class sand art across San Diego Bay toward North Island. 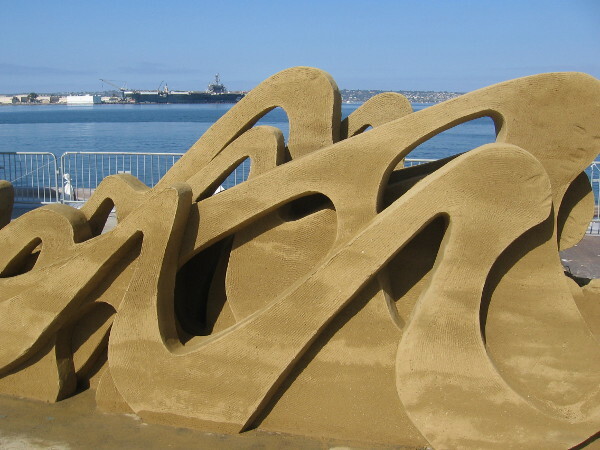 Eleven amazing works of art on the B Street Pier. 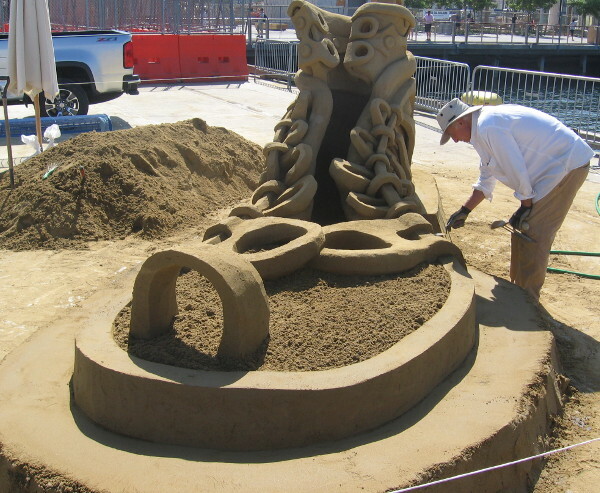 Plus there are other team sand sculptures getting started, and a few finished sculptures by event sponsors. Lots of cool stuff all over! 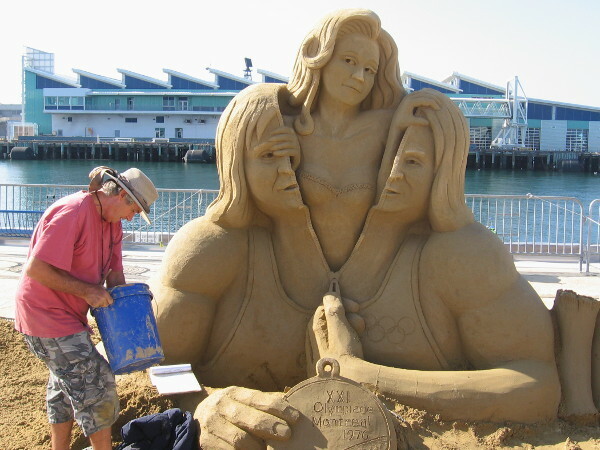 As of this moment, these are the finest sand sculptures in the whole wide world. In a few days…they vanish! Go see them now, if you can! 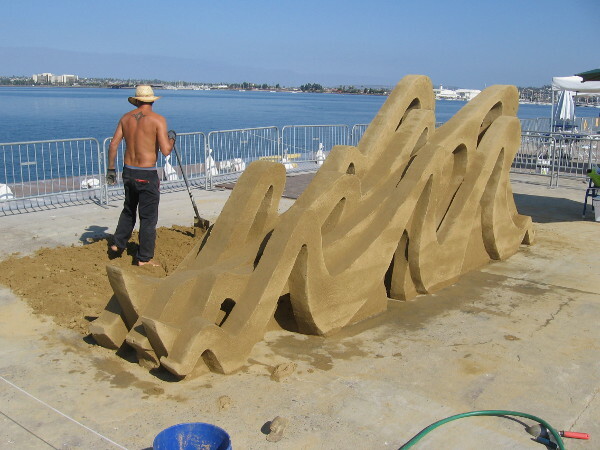 Posted on September 5, 2015 September 6, 2015 Tags amazing, art, artists, creativity, cruise ship terminal, imagination, olympic games, photography, piers, public art, san diego, sand sculptures, sculpture, sculptures21 Comments on Photos of amazing, incredible sand sculptures! 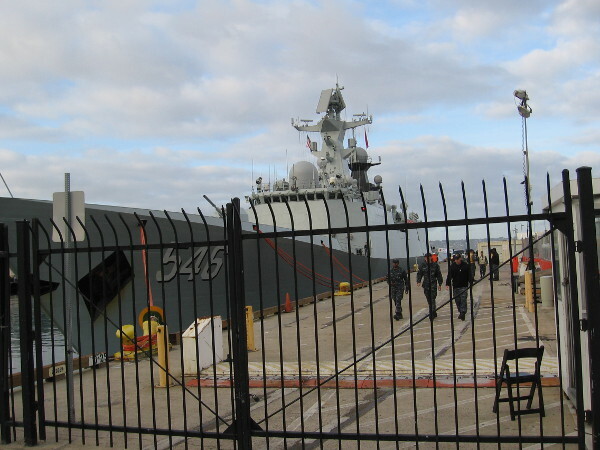 Japanese Self-Defense Force ships visit San Diego. 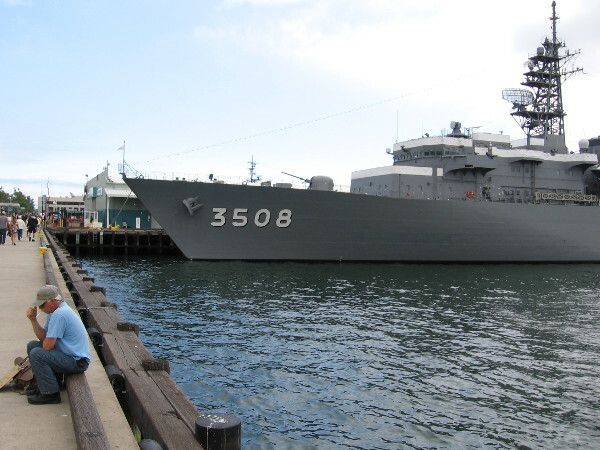 Three Japanese warships are visiting downtown San Diego’s waterfront. 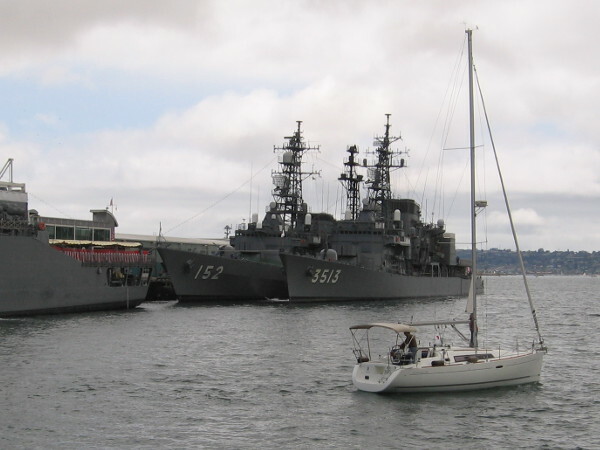 This afternoon I spotted three ships of the Japanese Self-Defense Force in San Diego. They were docked at the downtown Cruise Ship Terminal on the busy Embarcadero. The Japan Maritime Self-Defense Force must be training with the US Navy off our coast, although I find nothing about any joint naval exercises when I do a quick search of Google News. A year ago I spotted three warships belonging to Japan docked in the same spot. I see the big training ship Kashima, of the Japan Maritime Self-Defense Force, has returned. 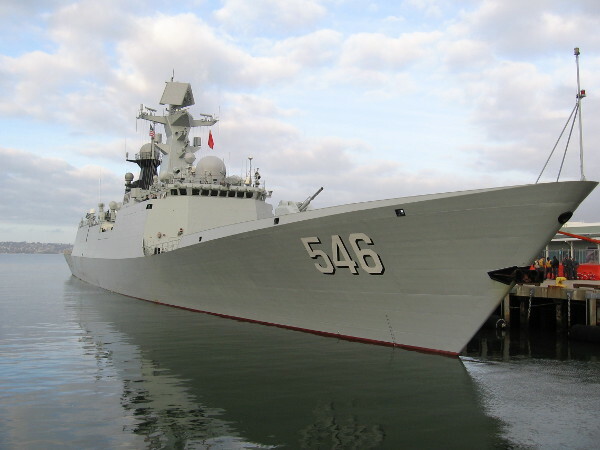 (Last year an article I researched referred to it as a landing ship.) I suspect the other two are destroyers, like last time. It’s an interesting sight you don’t often see up close, so I took a few pics! A sailboat on San Diego Bay checks out an unusual sight on a cloudy day. 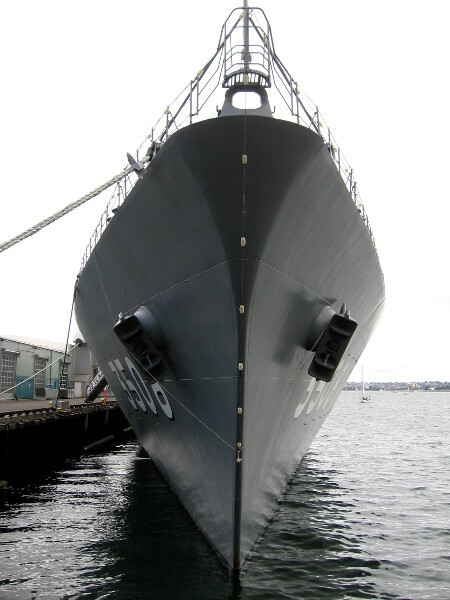 Bow of big training ship Kashima, of the Japan Maritime Self-Defense Force. Posted on June 13, 2015 June 15, 2015 Tags cruise ship terminal, downtown, embarcadero, japan, military, navy, news, san diego, san diego bay, shipsLeave a comment on Japanese Self-Defense Force ships visit San Diego. Two beautiful princesses cruise into San Diego. 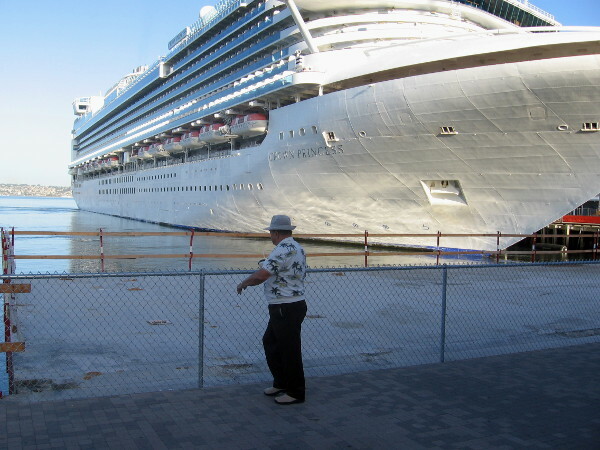 The huge Crown Princess cruise ship is docked on San Diego’s Embarcadero. Everyone has seen photos of cruise ships, but two beauties were docked on San Diego’s waterfront this morning and gleaming in the sunshine, so I had to whip out my camera! Once in a while, two or three cruise ships visit downtown at the same time. Some of these vessels are so huge that stood on end they’d dwarf many nearby skyscrapers. The two ships I saw in port today are operated by Princess Cruise Line. Both are classified as Grand-class cruise ships and have nearly identical lengths. Even after seeing them in person, it’s hard for me to grasp that these ships are 950 feet long! 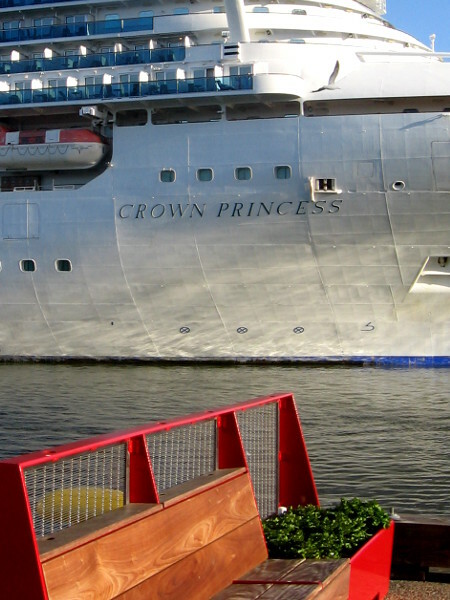 The Crown Princess can carry 3,080 passengers with a crew of 1,201. 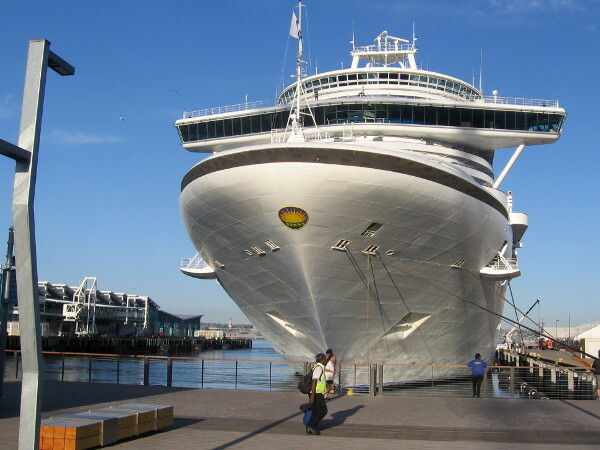 The Star Princess accommodates 2,590 passengers and a crew of 1,150. Incredible! 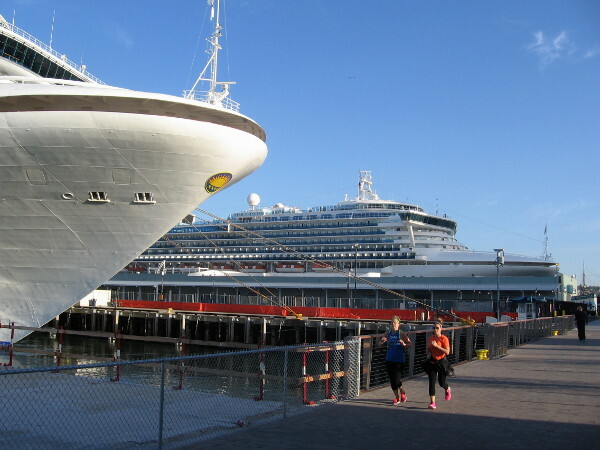 Two luxurious Grand-class cruise ships gleam on either side of the Cruise Ship Terminal. Gull checks out an amazing morning sight. Photo taken from the Broadway Pier. Man gazes at the sunlit bay. The fenced area is where the Bay Cafe used to stand. It soon will be an observation platform. 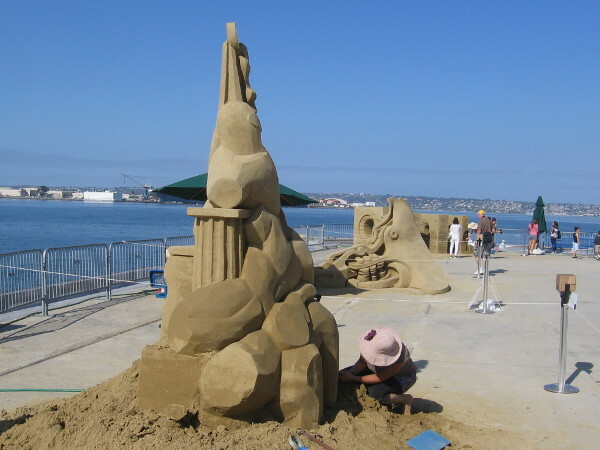 Posted on April 9, 2015 June 1, 2015 Tags amazing, beautiful, broadway pier, cruise ship terminal, cruise ships, embarcadero, port of san diego, san diego, san diego bay, ships, tourism, travel9 Comments on Two beautiful princesses cruise into San Diego. 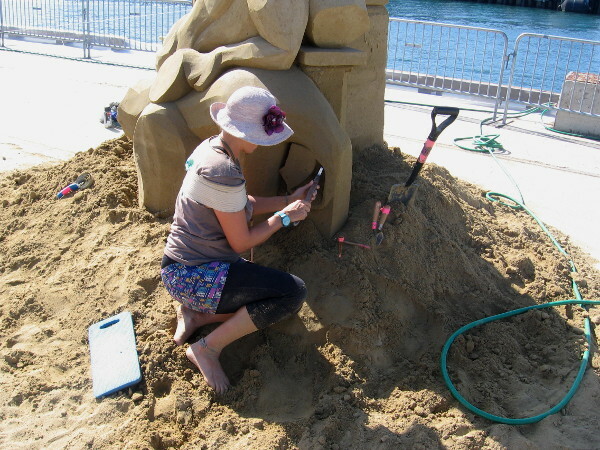 US Sand Sculpting Challenge and 3D Art Expo! 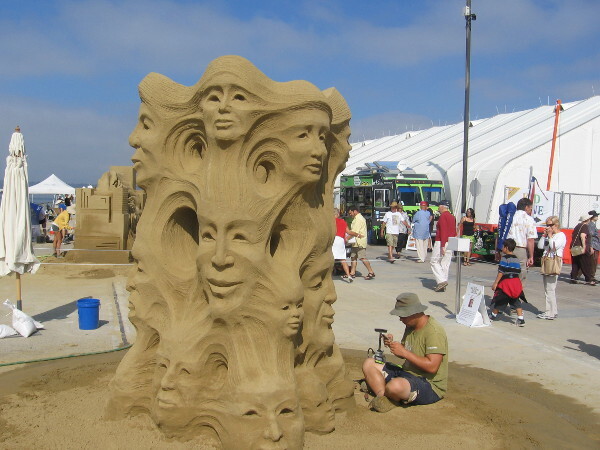 People arrive at the 2014 US Sand Sculpting Challenge and 3D Art Expo in San Diego. 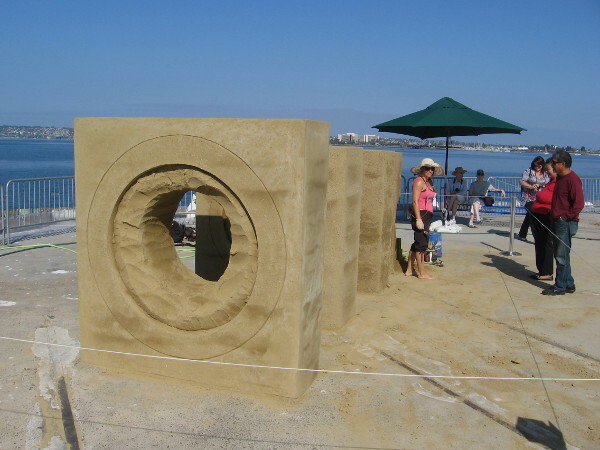 Here comes one more cool blog post concerning the 2014 US Sand Sculpting Challenge and 3D Art Expo! 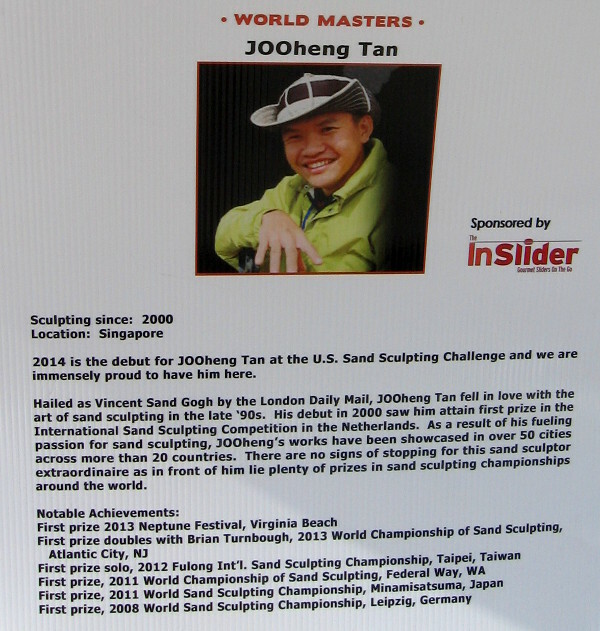 If you haven’t yet, please check out the SUPER AWESOME previous photos of the solo Sand Master competition at this event! Now I’m going to cover the rest of what I saw. 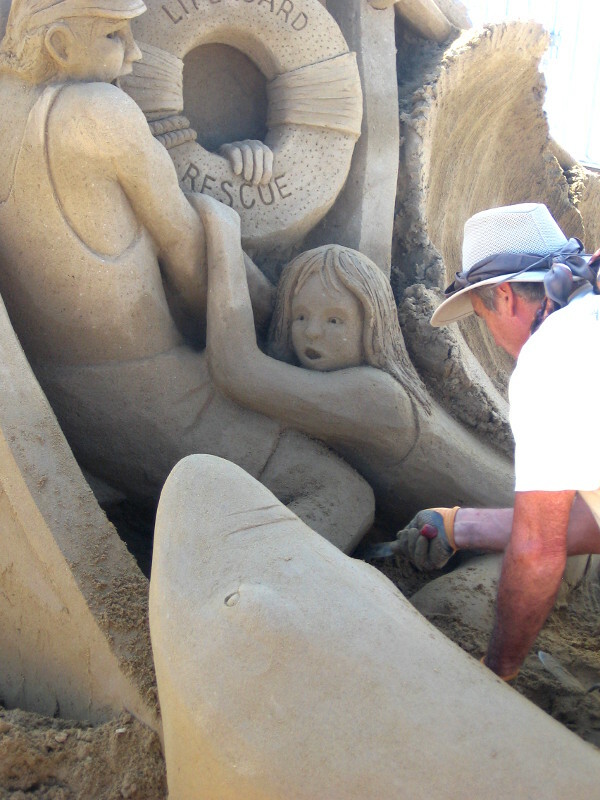 In addition to the incredible top international individual sand sculptors, a number of great teams also competed for fame and prizes. They started on their unique artwork today, so their creations seem in these early morning pics to have barely begun. 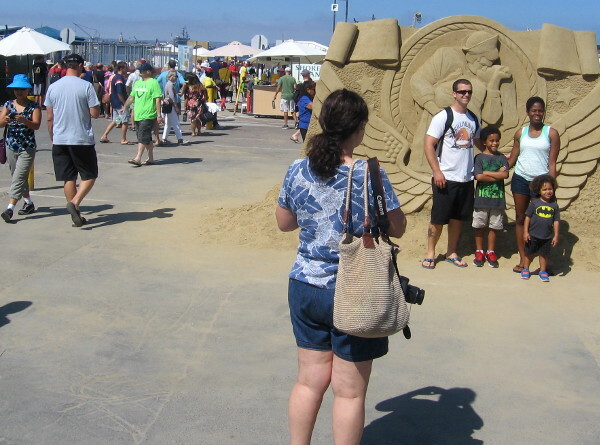 I also enjoyed looking at many art exhibits, and a few sand sculptures dedicated to event sponsors. 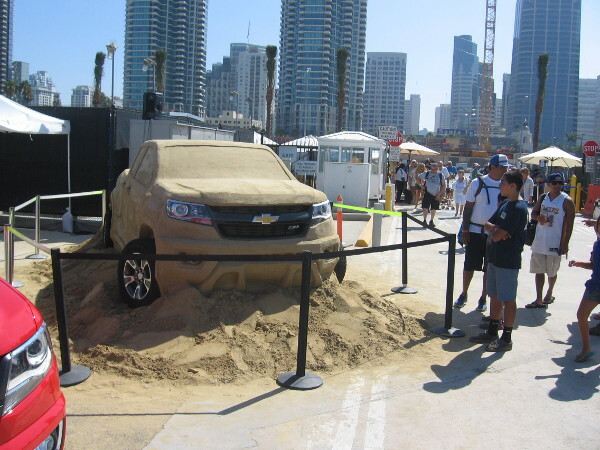 The fun event on the B Street Pier was sponsored in part by Chevrolet. 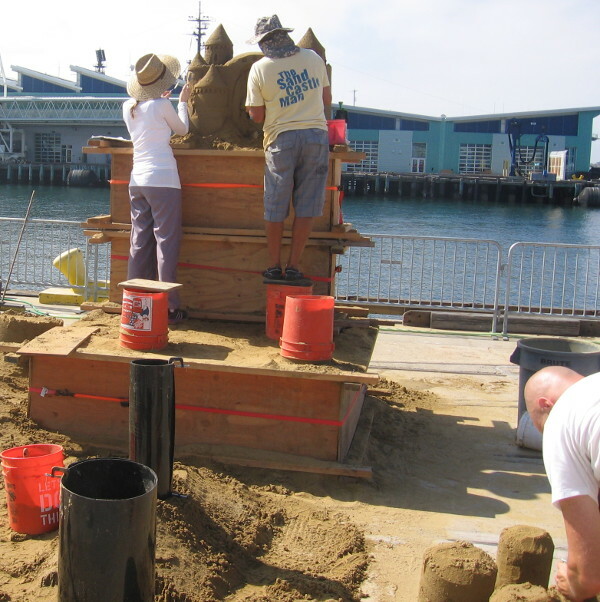 Teams create fantastic sand sculptures out toward the end of the pier. 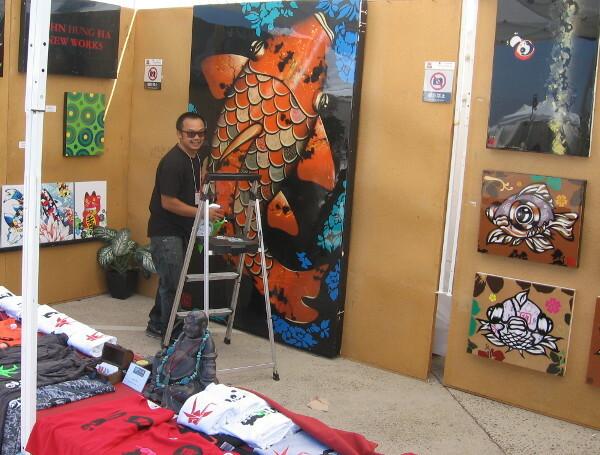 Many displays of art dotted the exhibition, as well as food trucks and a stage. 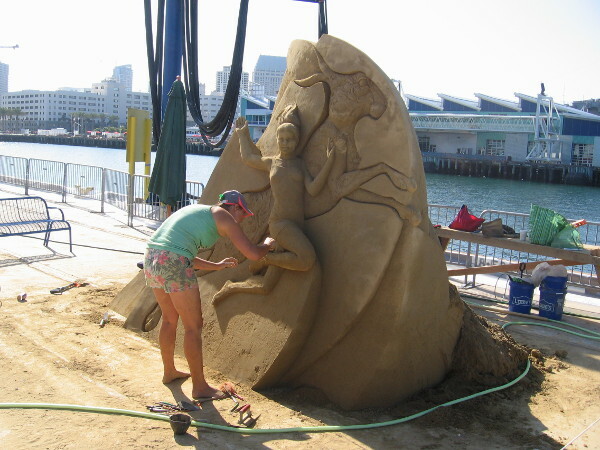 The teams began their sculpting on Saturday, the day of my visit. 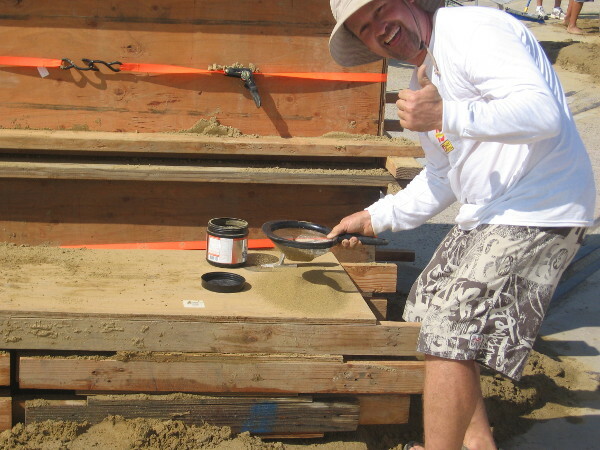 This funny dude sifting sand said he hadn’t found gold yet! Teams from far and wide get started on their wonderful creations. Some of the artwork you could enjoy was really sensational! 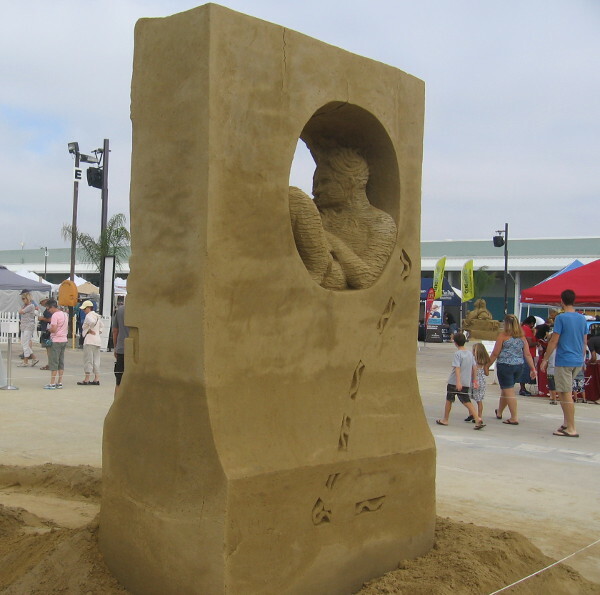 I saw the Sandcastle Man at the Imperial Beach event, too! Now that’s about as advanced as I am–a pail and shovel! 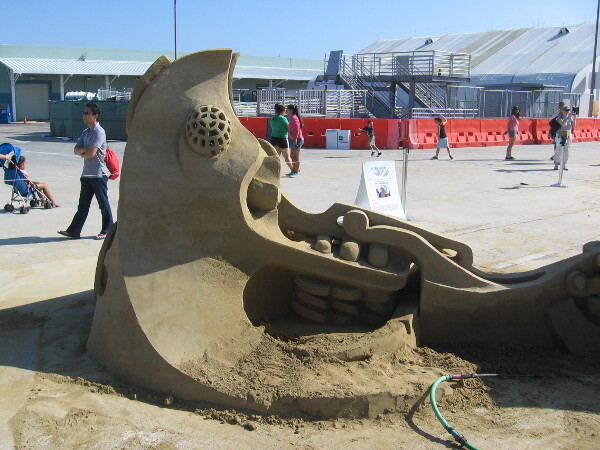 These sand heaps will be two demons cast into heaven by Buddha. 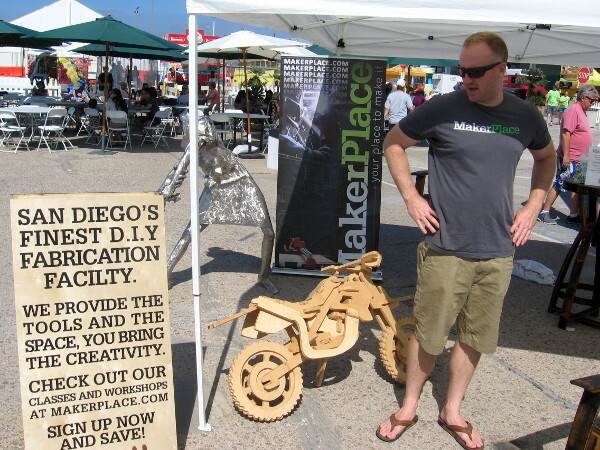 MakerPlace was there demonstrating their creative local facility. 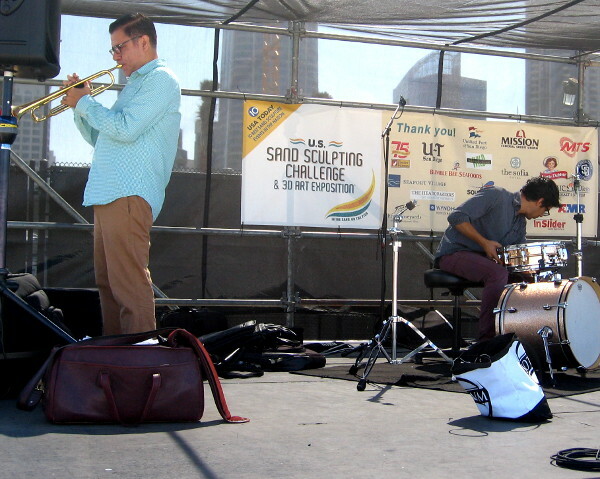 What a beautiful Labor Day weekend by the bay on the Embarcadero! 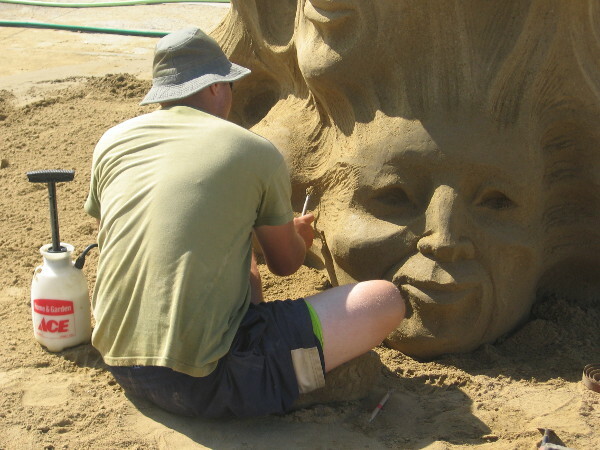 A close look at an artist sculpting with great care. Gazing back toward downtown, adjacent to the cruise ship terminal. The live entertainment hadn’t started yet early this morning. 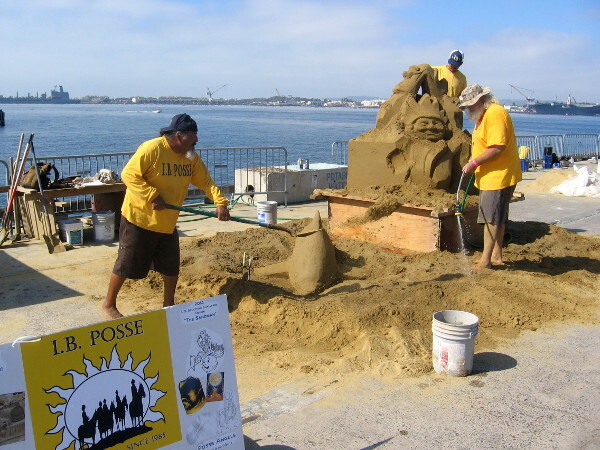 Another sponsor, Foster Farms, had their own very cool sand sculpture! Tomorrow I’m checking out the equally awesome Festival of Sail, so stay tuned! 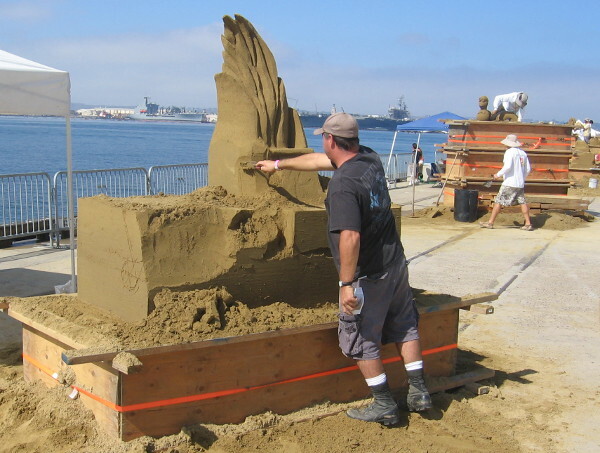 Posted on August 30, 2014 June 3, 2015 Tags art, artists, cool, creativity, cruise ship terminal, embarcadero, events, labor day, piers, san diego, san diego bay, sand sculptures5 Comments on US Sand Sculpting Challenge and 3D Art Expo! 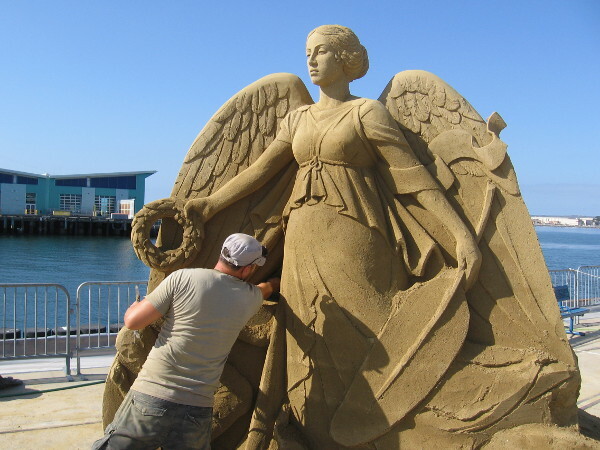 Ten world-class master sand sculptors compete by creating amazing masterpieces! 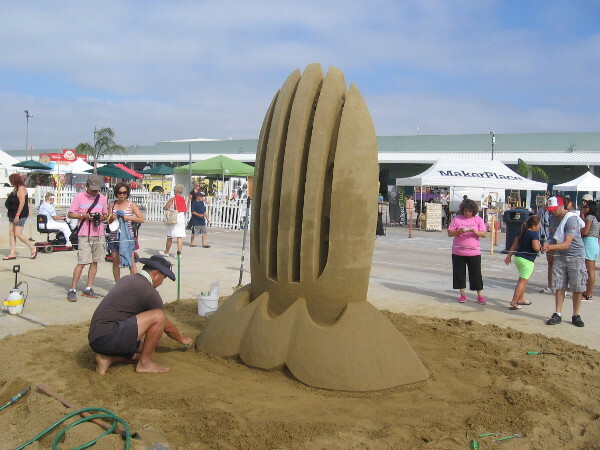 This morning I headed over to the 2014 US Sand Sculpting Challenge and 3D Art Exposition right as it opened, hoping to avoid the worst of the Labor Day weekend crowds. 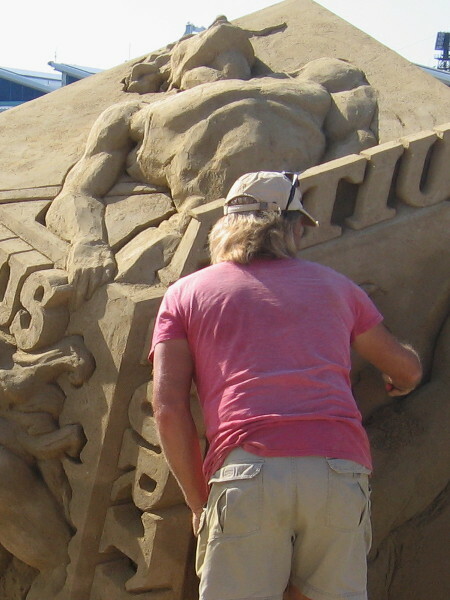 My timing was perfect, as the world-class competitors were all hard at work on their solo sand sculpture entries! 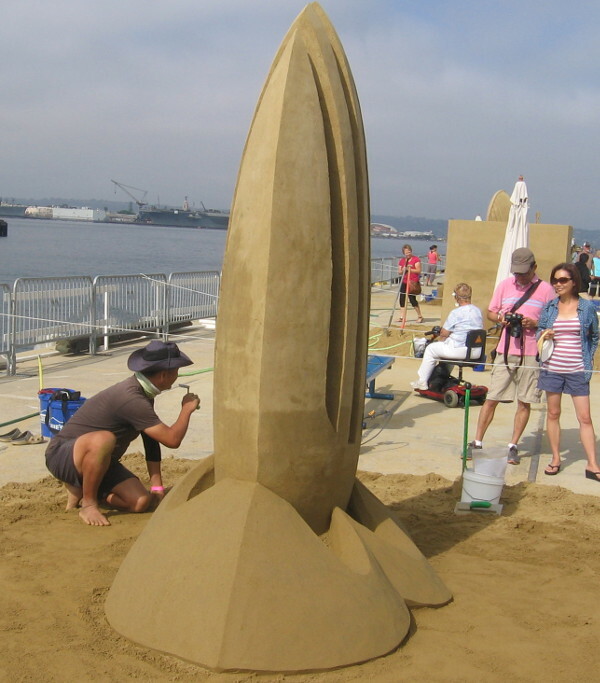 I’m told they began on Friday; it appeared their truly breathtaking masterpieces were nearing completion. 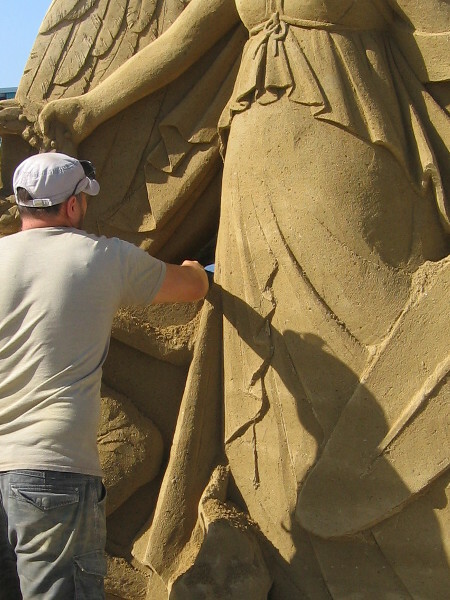 For your enjoyment, I present many photographs of these super talented international Sand Masters at work! 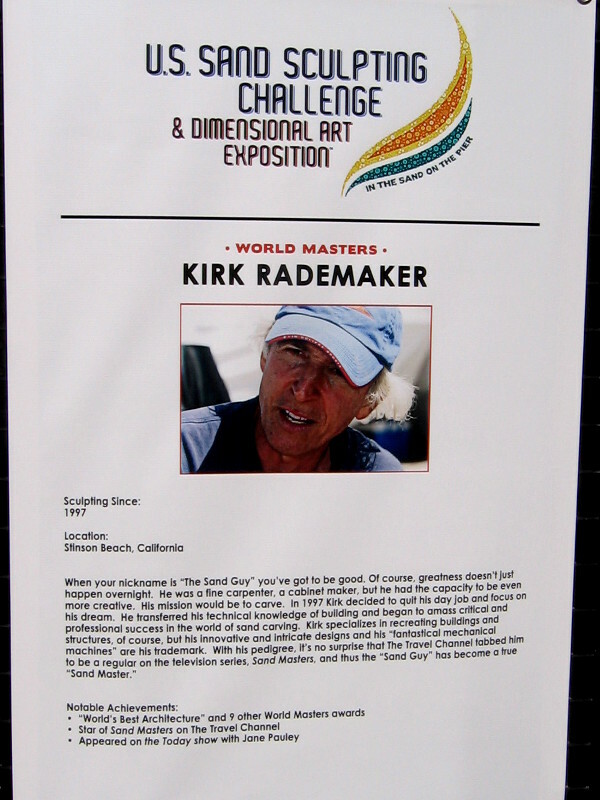 Kirk Rademaker is a Sand Master who has won 10 major international awards. 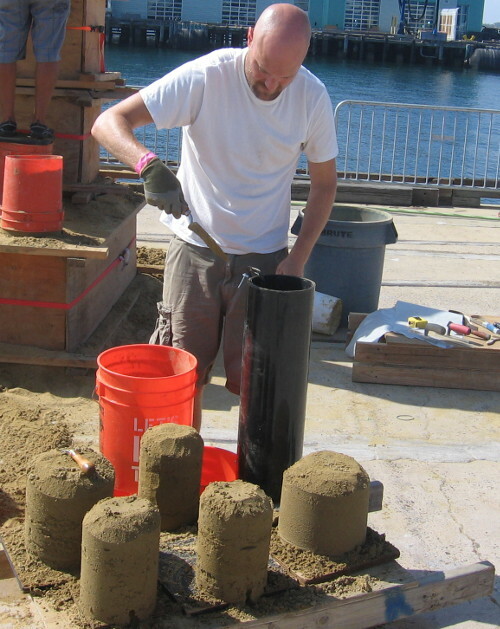 Kirk Rademaker works on his shoe sand sculpture on San Diego’s B Street Pier. 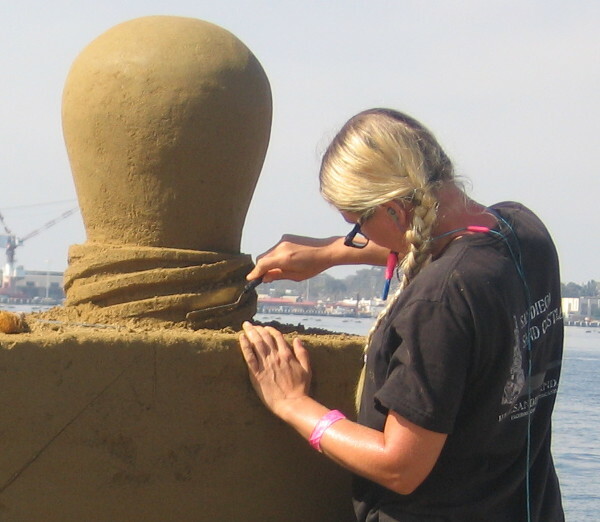 The master sand artists all work very carefully as big festival begins. Early Saturday morning, and the big Labor Day weekend crowd isn’t here yet. 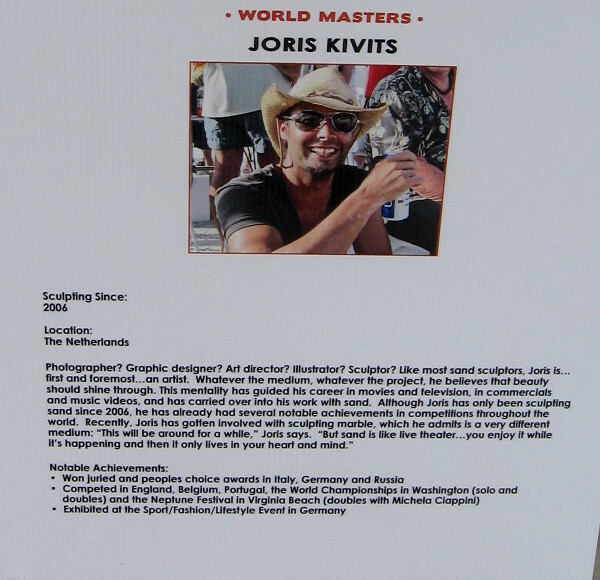 Joris Kivits from The Netherlands has won many awards in different countries. Joris Kivits works on an elegant, simply incredible work of art. 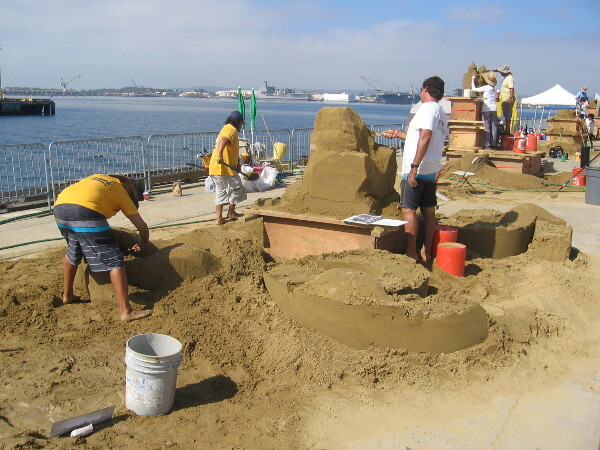 2014 US Sand Sculpting Challenge is in San Diego by the cruise ship terminal. 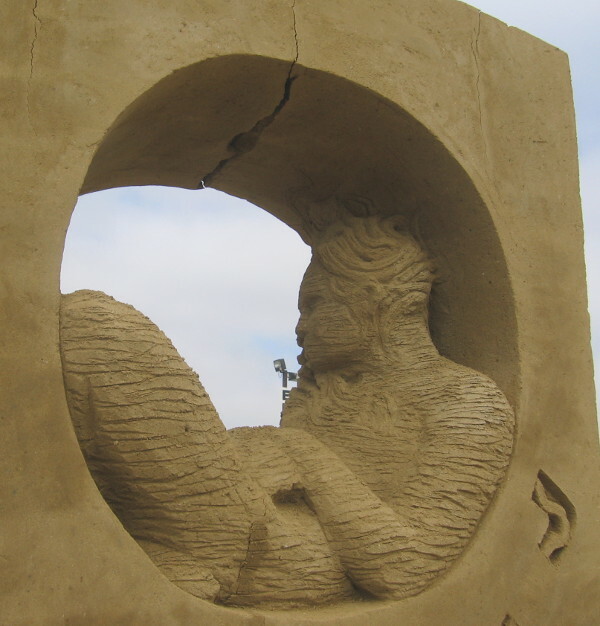 A close photo of some very fine work by a sand sculpting master. 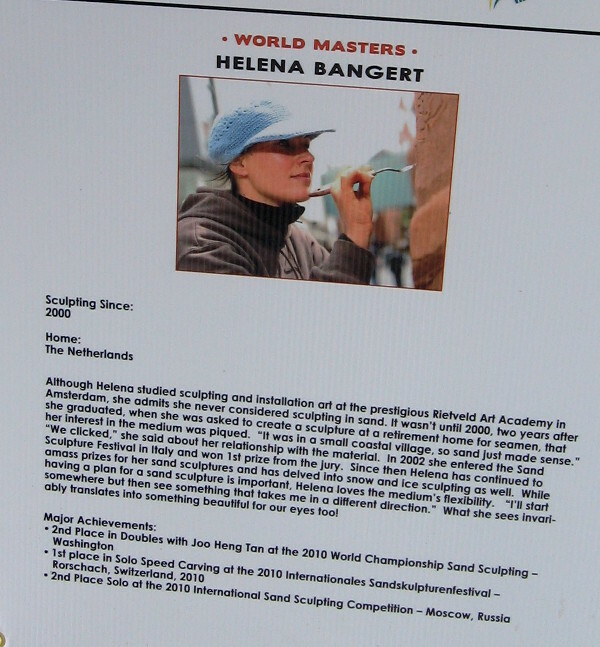 Helena Bangert, from The Netherlands, also does snow and ice sculpting! 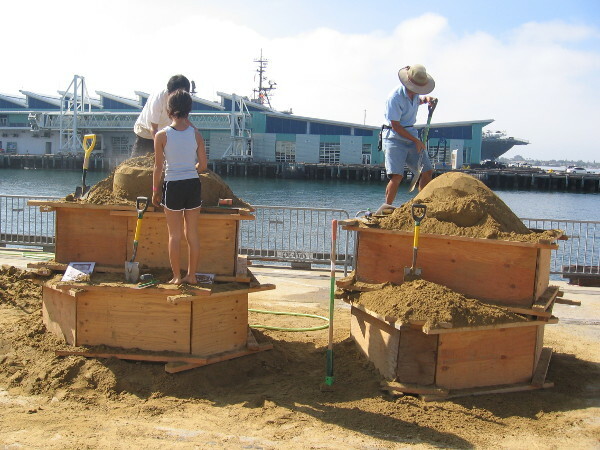 Helena Bangert steps back to look at her fantastic artwork on the Embarcadero. A lot of patience and steady-handed work is required to create each masterpiece. 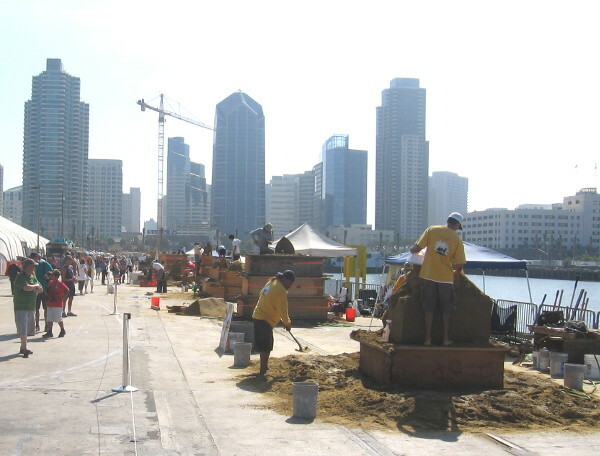 The skyline of downtown San Diego can be seen in the background. Chris Guinto has starred in three TV shows on the Travel and Discovery Channels! Check out my last blog post, which features Chris from days earlier! 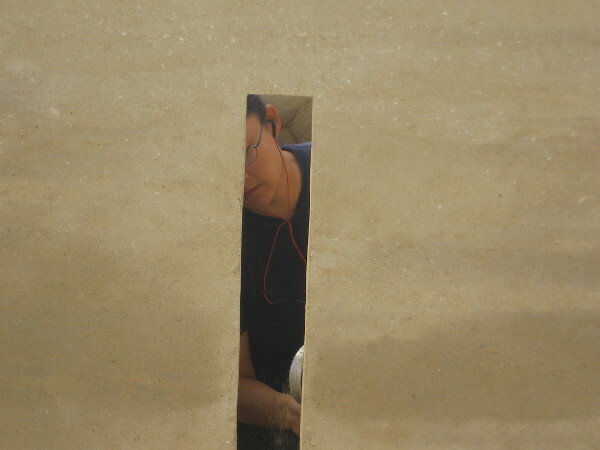 Chris Guinto concentrates as he carefully smooths an edge on his sculpture. 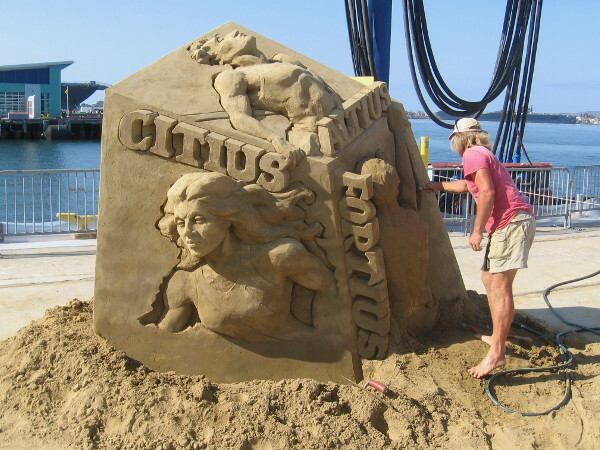 Chris is married to a master sand sculptor who’s in the Guinness Book of World Records. An exotic, unusual creation seems to depict an ancient warrior. 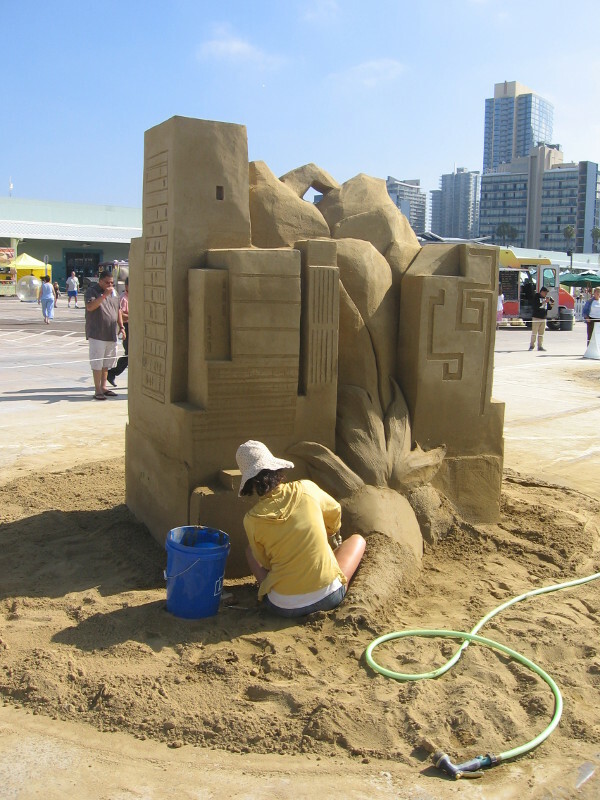 JOOheng Tan from Singapore is often called Vincent Sand Gogh! 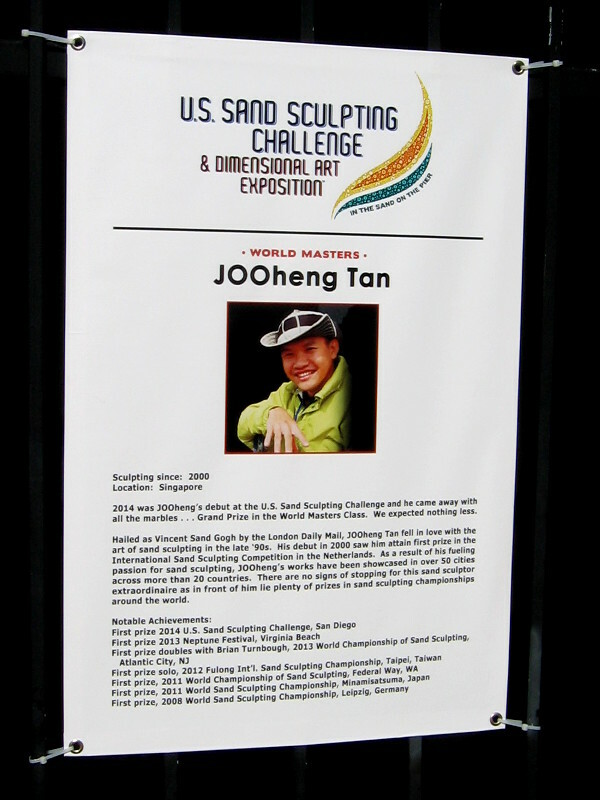 JOOheng Tan has won many top prizes around the world! 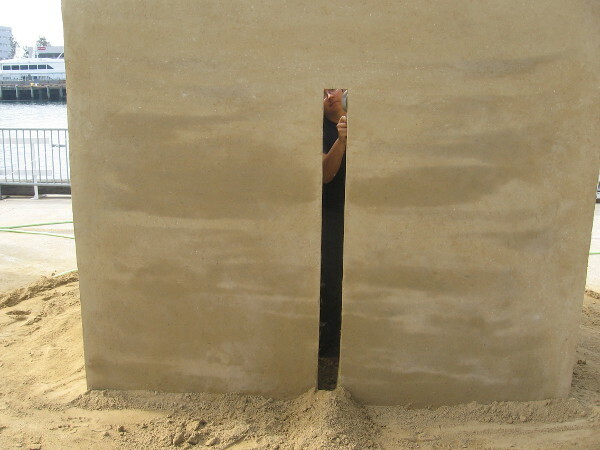 Look at the inside of the sculpture. Wow! 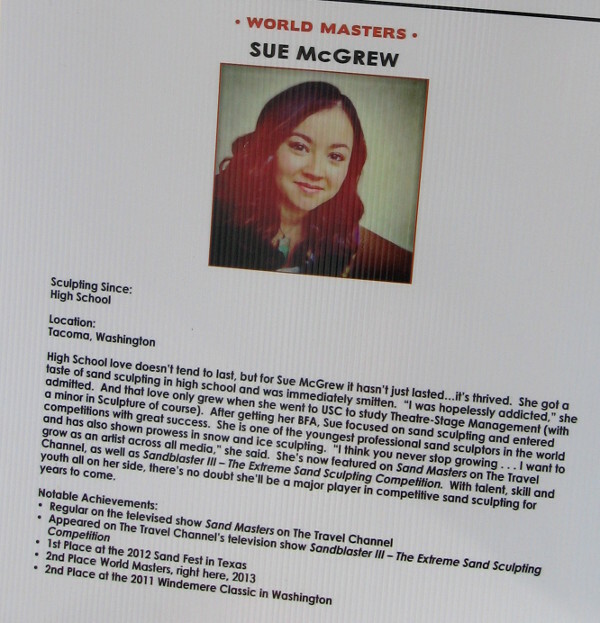 Sue McGrew is a star on the rise and has won several important competitions. 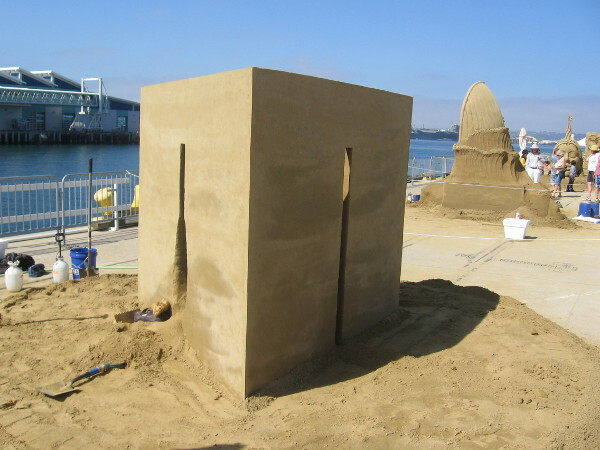 Where is Sue McGrew… She’s inside this strange sand box! 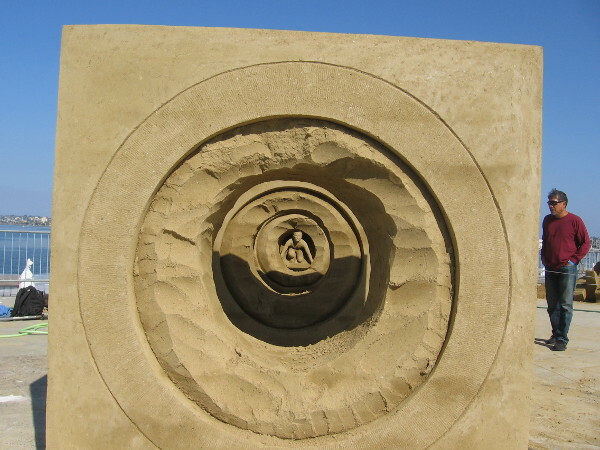 The art is inside this hollow, angular sand sculpture! I guess you gotta peek through the slots to see the finished marvel! John Gowdy is a Jersey boy now living in Italy. 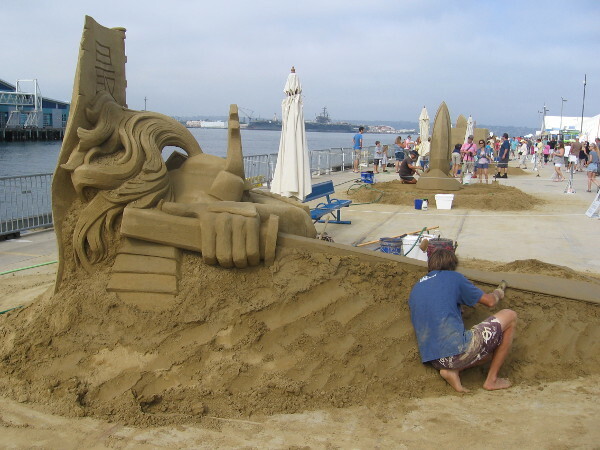 He won Sand Wars on the Travel Channel. John Gowdy’s piece is both amazing and dramatic. Some people in a row boat are being upset by a hungry shark! 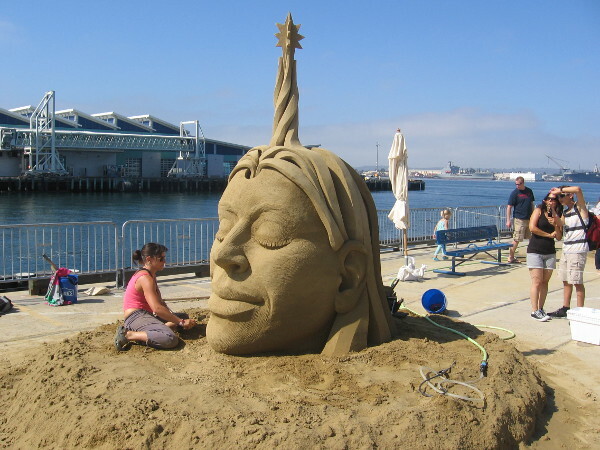 The vibe of this sand sculpture is crazy good. 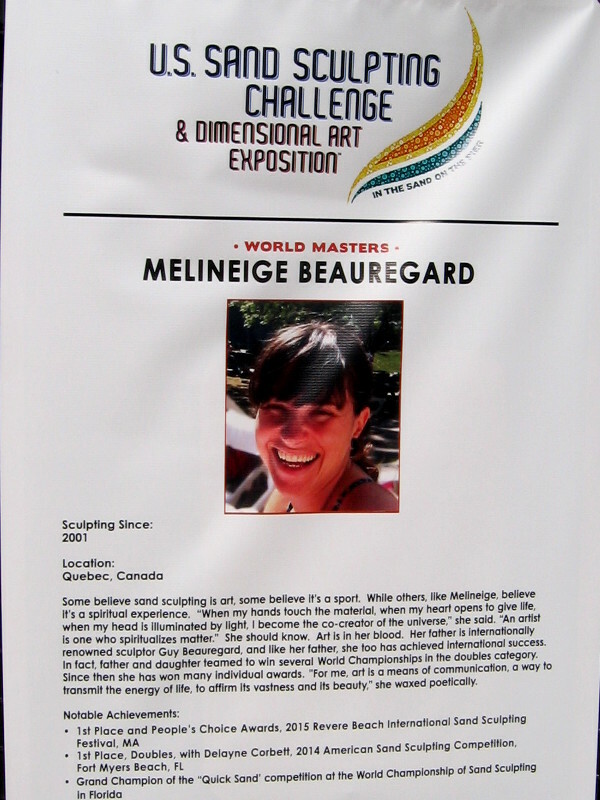 Melineige Beauregard of Canada believes sand sculpting is a spiritual experience. This stylishly rendered human head radiates with warmth. 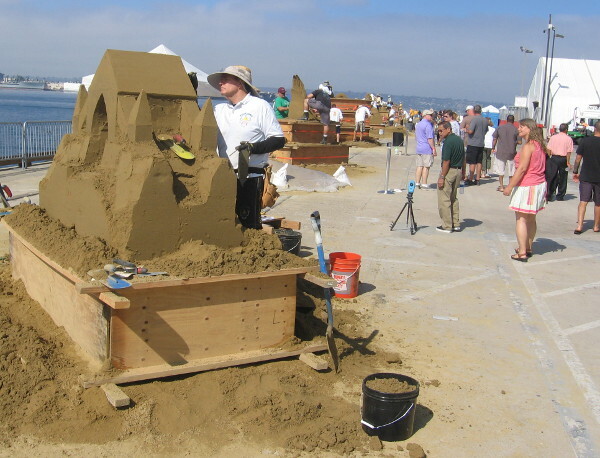 Visible are the Broadway Pier and a few visitors to the US Sand Sculpting Challenge. Melineige’s work of art has a second figure hidden within the hair! 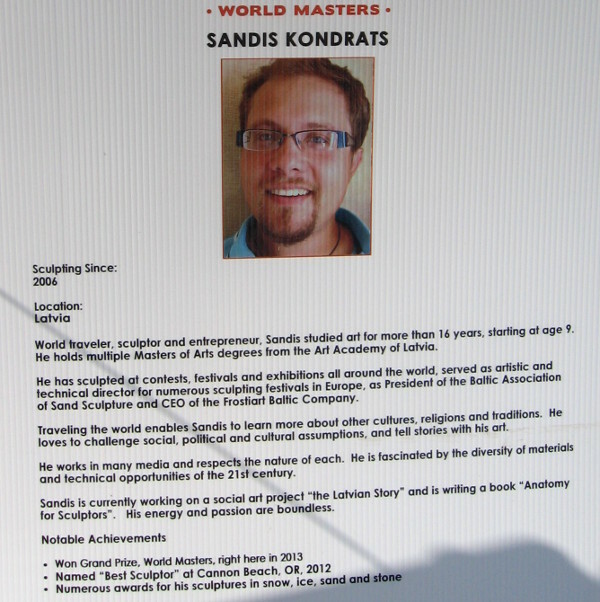 Sandis Kondrats hails from Latvia! 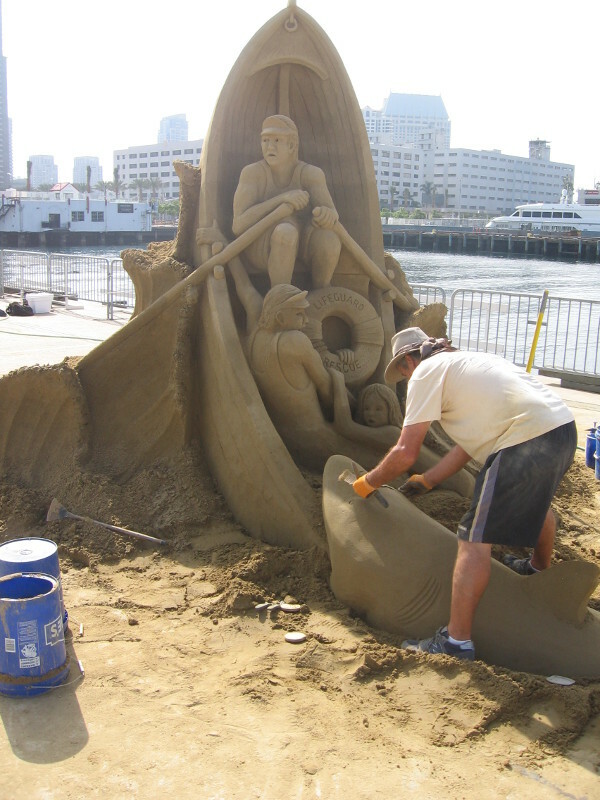 He won the Grand Prize at last year’s competition! Sandis Kondrats takes a break to check his smartphone. Very organic human heads are fused together in this fantastic creation. 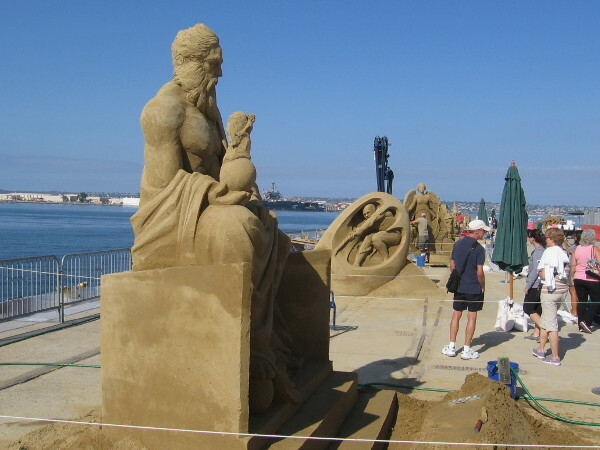 The world masters’ sand sculptures are lined up alongside San Diego Bay. 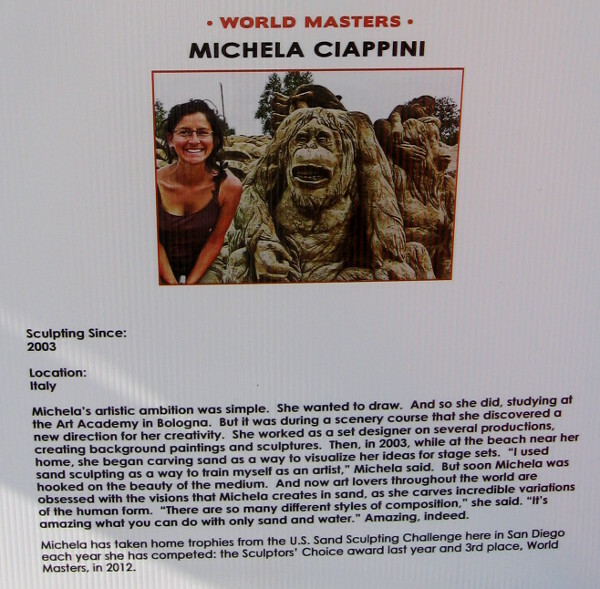 Michela Ciappini from Italy is a frequent trophy winner here in San Diego. One side of Michela’s sculpture is very sparse, modern and geometric. But something is growing between those straight sand buildings. 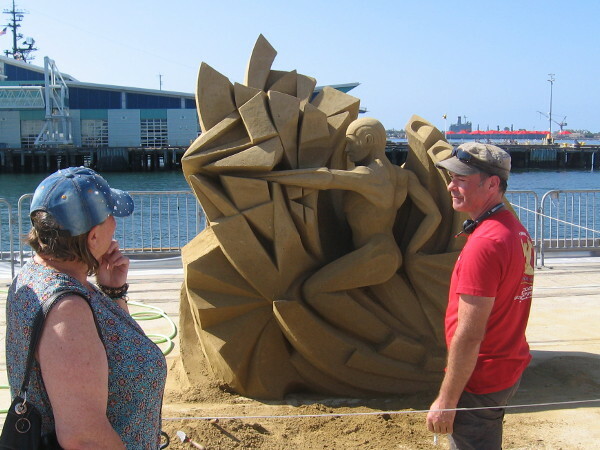 A huge sand rose and human form emerge on the other side! 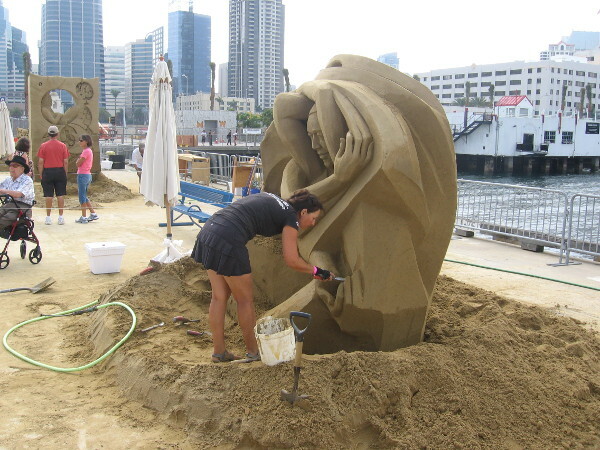 Posted on August 30, 2014 June 3, 2015 Tags art, artists, cool, creativity, cruise ship terminal, downtown, embarcadero, events, labor day, photography, san diego, sand sculptures38 Comments on Photos of world-class sand sculptors at work!